This is the third in a series of posts I am making, which will be extended to create a book, Around the World in 90 Minutes. When thinking of the trip to Bhutan, the first question is one of logistics. You cannot go direct to the country from the UK, so one has to go somewhere else and then change. 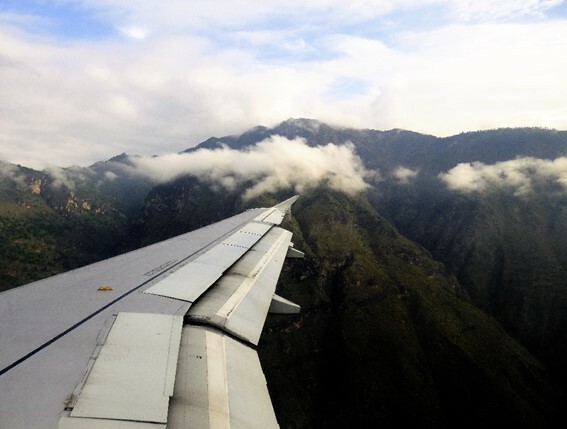 Bhutan is one of two small countries, sandwiched in the Himalayas between India and China, and my first thoughts were to fly to Kathmandu, and then use the flights between the two capitals. However, Nepalese football is a mess. Some of my friends spent a week there when there was a tournament, and said I should try to also go for a week. 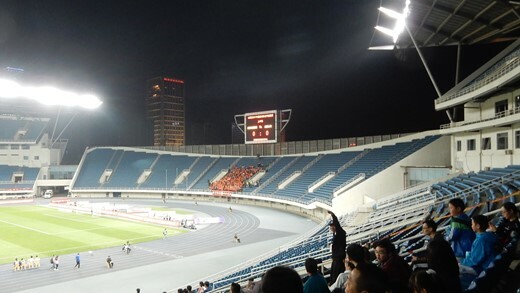 There was an international match in the Asian Cup qualification, but this was on the second stadium in the capital. The primary stadium appears to be out of use. 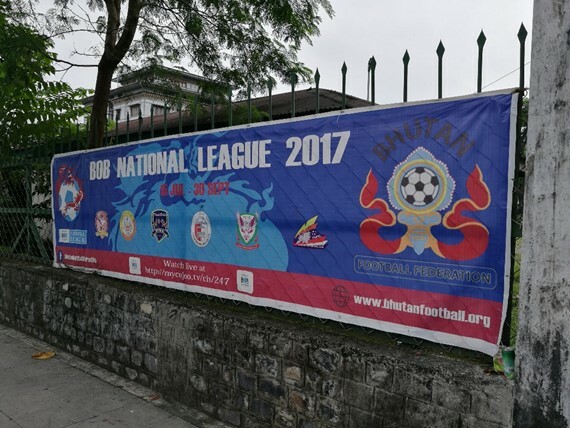 There are no signs that a Nepalese League has restarted, since suspended due to the earthquake in 2015. Local websites show that there appeared to be an intention to restart this season, but it appears they never go around to it. I would still like to go to Nepal, and I am looking out to see if they resume league fixtures next year. I considered a short jaunt to India, although my mind says that this is the least sensible place to visit on a short trip. Anyway, for this season there was a FIFA Under-17 season being played there, with the result that the league season was delayed in starting. 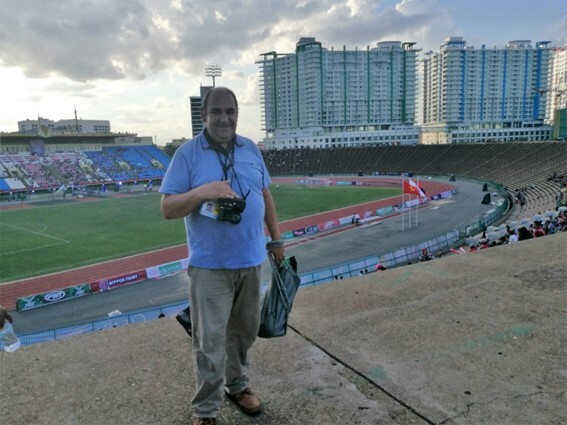 My trip was to start during an international weekend, so I checked Singapore, which also has a direct flight into Bhutan – but the new National stadium was not being used for their Asian Cup qualification game. Probably on the grounds that hardly anyone was going to watch it anyway. 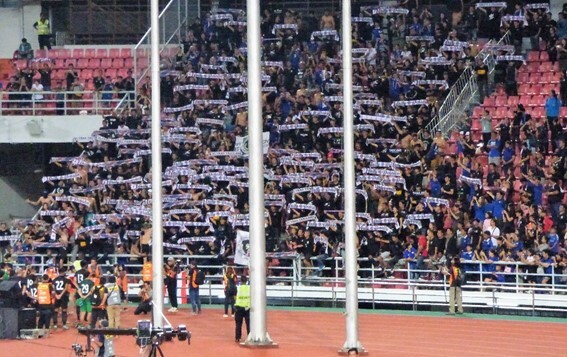 (They got 3,712 at Jelan Besar for the game against Turkmenistan, and surprisingly they then chose to play at the National stadium against Bahrain, with less than 3,000 turning out). And so, it had to be Thailand – a place I am quite familiar with, but where I have not seen fixtures since they installed a proper national league structure. The next question for anyone travelling the Bhutan is getting in and around. You cannot simply apply for a visa, book flights and hotels and arrive at the airport. 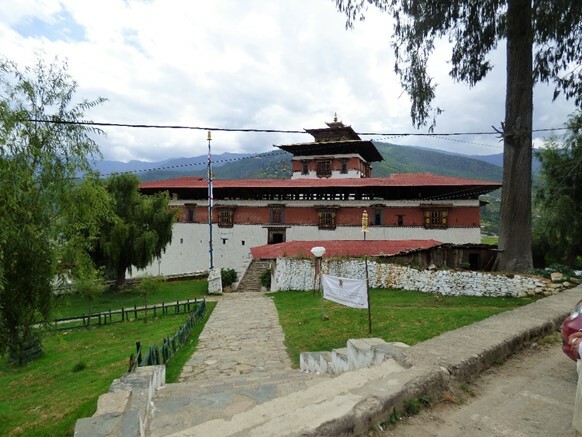 Bhutan travel is dependent on booking through a tour agency, and paying in advance for all transport, hotels, meals and visa fees. Most tours take the visitors up from the capital into the mountains, and then onto a trek, while I wanted to take in football matches in the other direction. Also, I wanted to be sure the fixtures were as published on the soccerway international website. I sent e-mails to three tour agents, chosen at random from the list. I am still awaiting a reply from two of them. 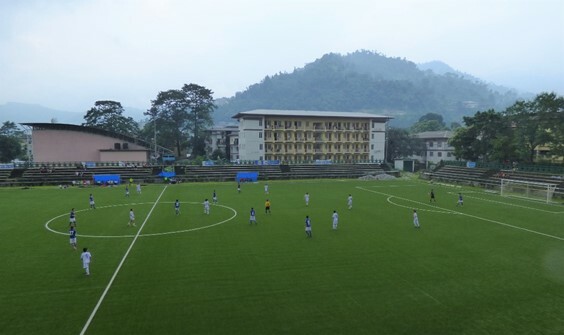 The third proposed a tour, and confirmed the fixtures for the remainder of the season with the Bhutanese Football Federation. In this case, Soccerway was accurate. The Bhutan government demands a minimum spend for everyday spent in the country. This is reduced for larger tour groups, but I was on my own at the full price. 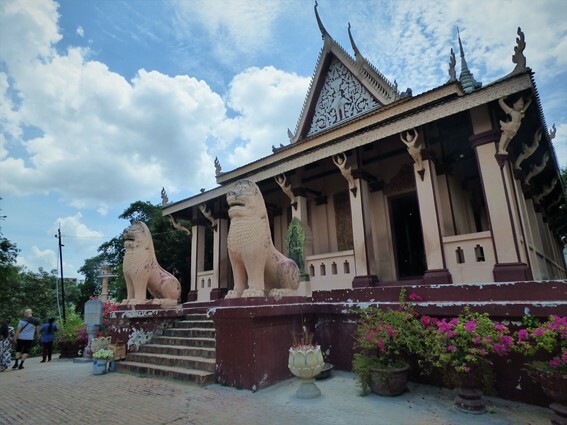 There was a delay in getting the money through the international banking system, so I ended up arriving in Cambodia on my side trip before I finally got my visa through. For the record, a tour starting on a Friday, finishing on a Tuesday and including four nights in local hotels, and including flights to and from Bangkok cost £1655. 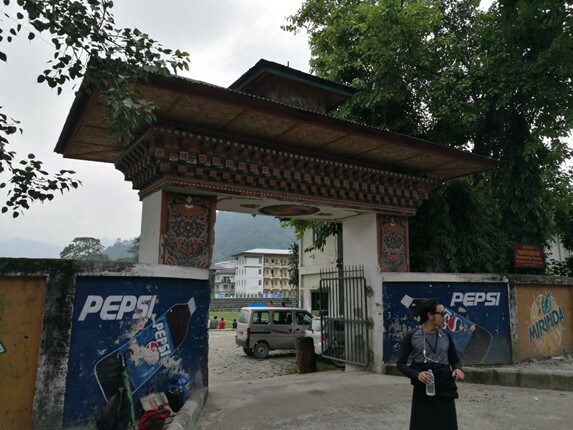 Within Bhutan, my only expense was beer! I might have been expected to pay to enter the football grounds, but they did not make a charge. My tour guide did take me to a few places where no doubt he would have got commission if I had bought some arts or crafts, but no luck for him there. After my trip to Cambodia, I got back to Bangkok airport around 10.30 at night, six hours before the flight to Bhutan was due to leave. I was disappointed that Thai Airways would not book my luggage through, so I had no choice but to go through customs, pick up my bags, wait until two, go through check in and security and finally board the flight to Bhutan. This means filling in the arrival form for Thai immigration, and queuing to enter the country. I did not please the official here as I had not stated where I was staying – so I had to explain I was not staying. The flight was in two stages, firstly to a small city in North East India, and then after a short break onwards to Paro. On the first stage, it was the fight between airlines and sleep. One is close to nodding off when they come around with the meal, and after this has one again is close to sleeping when the plane lands. On the second leg, the pilot points out one of the world’s highest peaks to our left at over 29,000 feet. This is immediately after announcing we were cruising at 19,000! They even warned us not to be alarmed by the landing pathway, where the plane dives into the valley, with hills both sides, and then banks right to the airport. It reminds you of the 1,762 (estimated figure) feature films where the hero is flying the plane, being pursued by the bad henchmen, and then swings violently to one side, while the other plane crashes into the mountain side. I can tell you there was no pursuing aircraft, and although Paro is listed as one of the world’s most dangerous airports, the Aviation Safety Network reports “no incidents”. On the first day, we took just a short look around Paro, the town posts a large Zhong (which is a local fortress) and the national museum, and two main streets, one of which appeared to be for the local shopping, and the other filled with tourist tat. One of the features of the tourist tat on offer, is the amount of phallic art. 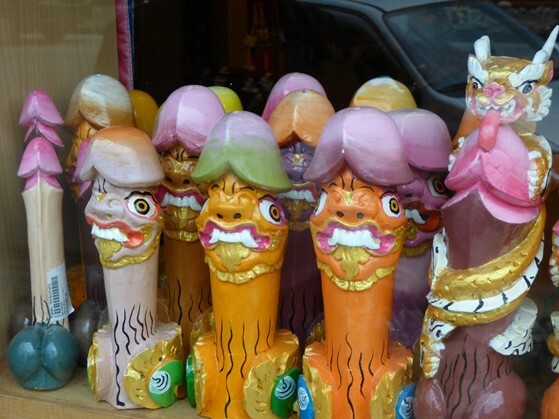 Phalluses pictures are common sites in Bhutan, and can often be seen on the sides of houses and other buildings. This is put down to the “divine madman” the Lama Drukpa Kunley, who preached some 600 years ago, and apparently succeeded in shocking the conservative morals of the religious state of the time. At one end of the street were the archery grounds. 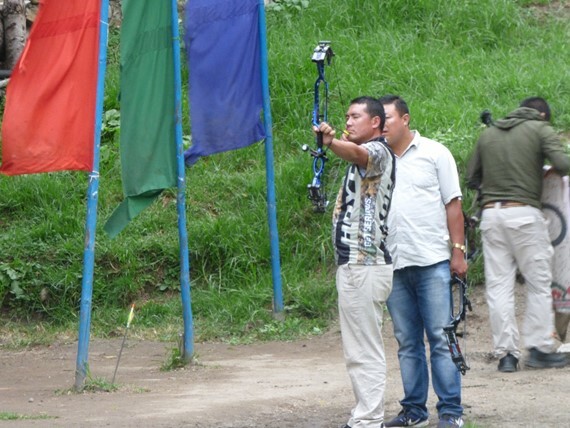 Archery is publicised as the national sport of Bhutan. 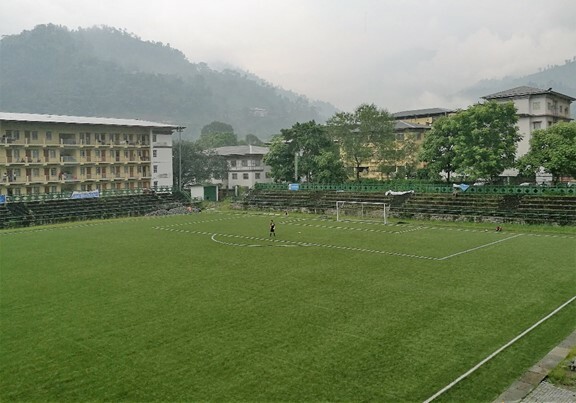 They actually have more people involved in football, (according at least to the Bhutan Football Federation), but I think they like to show something different. 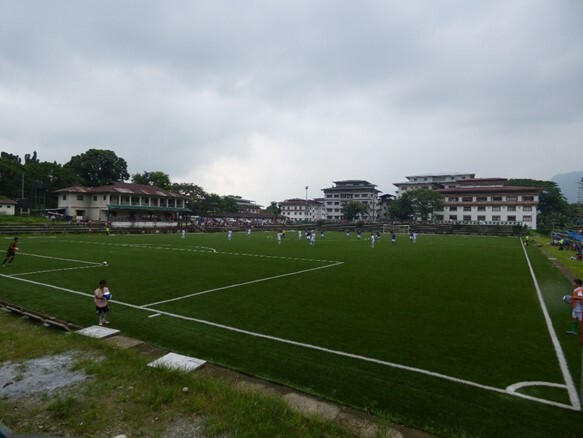 On arriving at the grounds, a match had just been completed, but we stayed for a while to watch other players practicing, and to give me a first try at Bhutanese beer, (a not unpleasant, but unremarkable lager). 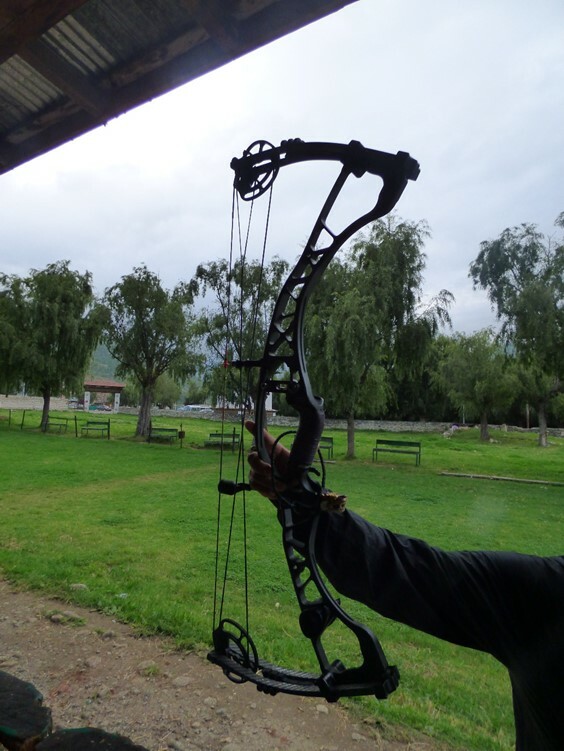 Bhutanese archery is not the same as the sport you may imagine. The archers have to fire their arrows at a small target over 100 yards from their standpoint, a group of archers will fire from one end of the range to the other, and then all move down to the other end and repeat the exercise in the opposite direction. The arrows on the other hand are as simple as they come – a straight shaft, with small flights at one end, and a pointy bit at the other. 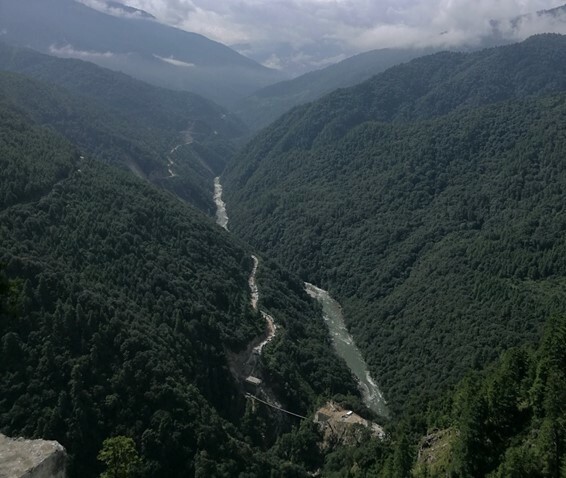 It was the next day that the adventure really started, and I got my view of Bhutan. Paro is in a valley, some 7,200 feet above sea level, (for comparison Ben Nevis is 4,400 feet). The road I would take rose about 1,500 feet from the valley floors as we found the pass between valleys, while the mountains each side of us were generally around 14-15,000 feet, about as high as the highest in Europe. The really high mountains in Bhutan are further north than my journey would take me, but I was still surprised to pass peaks this high with not a sign of snow anywhere around, just trees all the way up to the summits. 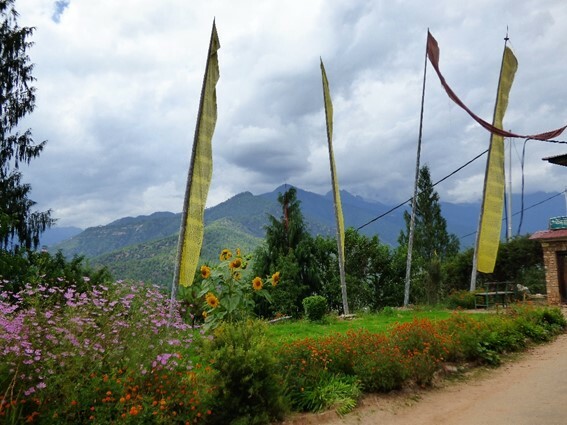 There are many ways in which Bhutan is a remarkable and unique country. The trees are the secret to one of these. Bhutan is the only country in the world that is carbon negative, that is it absorbs more Carbon Dioxide than it produces. In Bhutan, they drive on the left. Some of the time. The driver explains his routing in keeping to the better road surface and avoiding pot holes. It also involves approaching corners where you cannot see whether or not there is oncoming traffic on the wrong side of the road. More than once, as you turn the corner, vehicles in both directions are swerving from the right-hand side of the road to the left and somehow avoiding meeting in the middle. When we get to the narrower roads in the mountain passes, there is often hardly room to pass, without one vehicle coming dangerously close to the precipice. The potential drops make Michael Caine’s position at the end of “The Italian Job” seem like one small step. Still, all drivers assume that if you cannot see another vehicle, there is not one, and that stopping or slowing down is only considered while actually making the passing manoeuvre. There is one thing that will persuade a vehicle to slow down. Cattle. It appears that they rule the road, and can stand or walk wherever they like. Even close to the towns it is not unusual to see a few cows wandering down the road or just taking a nap. You can blow your horn to warn a dog, a monkey, a car or a human that you are coming – but for a cow, one will quietly manoeuvre around the obstacle. You may even find someone coming the other way will slow or stop for you. The state of the roads in places is a reminder that even the mountains are no more than a fleeting phenomenon in the history of the world. The potholes have been created by subsidence, ice, rain and rockfalls. It may take millennia to complete the process, but slowly and surely the weather, snow and ice, wind and rain is winning the war against the forces that create the mountains, and one day what are now the highest points of the earth will be reduced to gentle rolling hills. In the meantime, the roads are being eroded on a weekly basis, and it takes constant work to keep them open. As part of the curious relationship between Bhutan and it’s southern neighbour, much of the road maintenance is undertaken by the Indian Army! 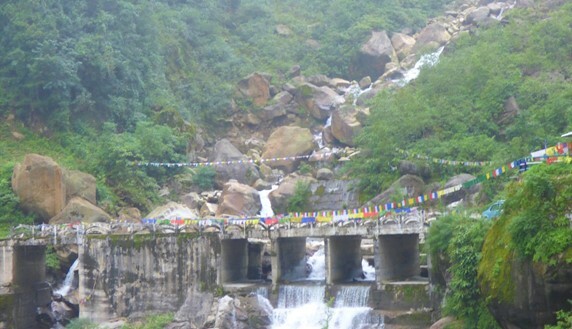 The road to Phuentsholing is one of the busiest in Bhutan, and the journey of 170 km will take four hours of driving. Bhutan depend on imports for most manufactured goods, for oil, and for some of their food. 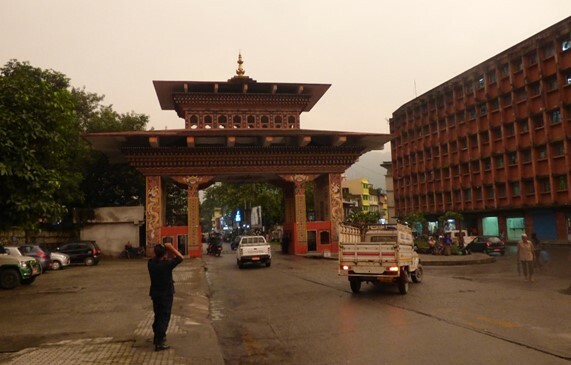 Almost all of this comes over the border from India through Phuentsholing, and then up the road we are travelling. There is therefore a constant movement of trucks, buses and cars on what is the country’s most important highway. 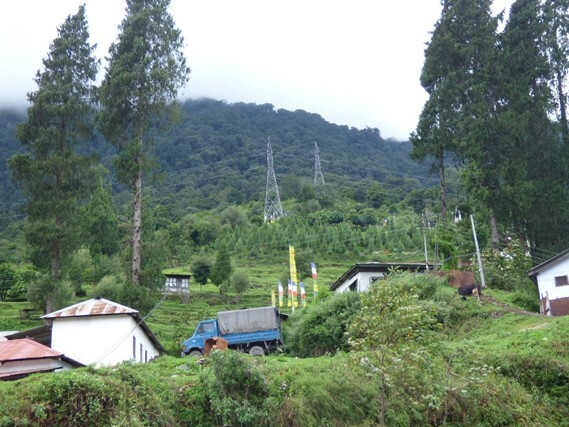 By contrast, Bhutan’s largest export is electricity, generated 100% from hydro-electric power stations. Especially as we started the descent to the border, the road was frequently crossed by the power lines conducting this out of the country. The second biggest source of foreign currency is tourism, despite the price structure that keeps the independent back packer at bay. Naturally, I asked about this, and was told that about 25% of my money went straight into the exchequer as tax, while everything the tour company paid for would also be subject to a tax (around 10%). 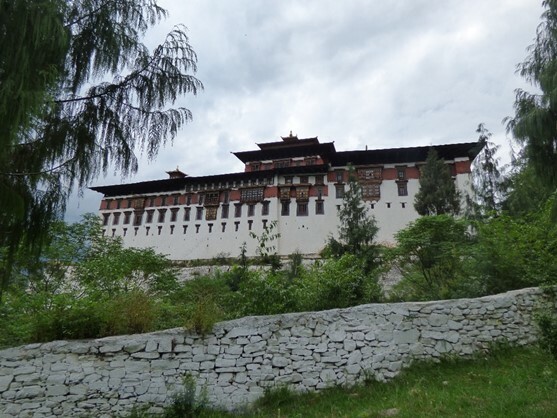 Bhutan does not raise much tax by personal taxation. It is a country with hardly any middle class, and as anyone knows the poor do not have money to pay taxes, and the rich have lawyers to avoid them. Bhutan provides free education and health care to all, so my tax dollars were being put to use somewhere. As this being the land where the measure of Gross National Happiness was invented, I asked about whether this was real, or just a gimmick. I had been disappointed that the links on the airline’s web page did not work, so I could not join their frequent flyer programme and get a “Happiness Card”. Sadly, the national anthem is a bit of a dirge telling everyone how wonderful the king is. It really ought to be Ken Dodd. The answer on the happiness question was not clear, but seemed to be about happiness coming from not desiring things you cannot have. The person who told me this, though, also said he really wanted a nice car. Meanwhile, the couple behind me in the queue at Bangkok airport for the flight checked in with two televisions, while I saw another person with a television in the line. (Apparently all electronic goods are cheaper in Bangkok, and one person can bring one TV through customs). 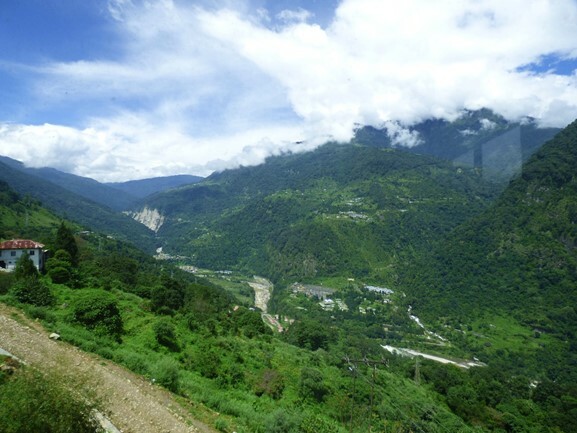 There is a sudden change as you approach Phuentsholing, the altitude you are dropping at quickly, and you can see a bright and wide river in the distance, with the sun shining across it, it looks almost like a bank of gold shimmering in the haze. The haze is of course, a reminder that the clean air that is a feature of most of Bhutan will not be so prevalent when one gets down to this city. 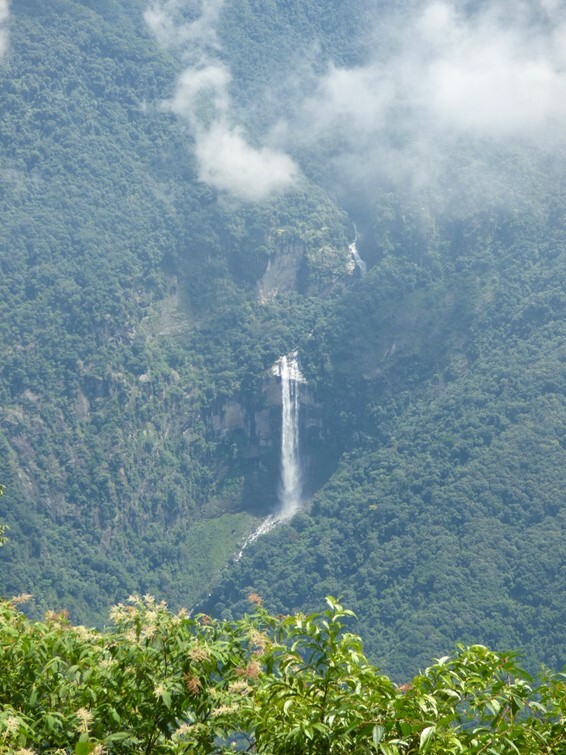 By the time you arrive at the town you have dropped down, so as you are less than 1000 feet above sea level. There is a heat and humidity that one did not feel while higher up. We pull off the road just to the left of the monument, I am less than a Sunil Gavaskar drive from the Indian border, but I do not have a visa to pass through the gate. I rest up at the hotel for a while. They were supposed to provide a meal, but somehow this got forgotten. I almost misjudge the timings, as I am so close to the Indian border that my computer has switched to Indian time. Fortunately, I do manage to stir myself in good enough time, and on my guide’s advice, we walk back up to the ground, which we had managed to spot when coming into town. The walk is less than 10 minutes, the weather is warm and humid, with a threat of rain in the air. We enter through the gate, there is no admission charge. I like the ground, the stone wall and archway entrance gives it gravitas before you even enter. Around most of the ground, there are about five steps of stone terracing. There is a building on one side with two floors, and providing the only cover from the weather. During the second half, I take some shelter there as it starts to rain. I quickly obtain a view of the visiting team list, they are the league leaders and have six substitutes named. The home side are a little more reticent. It turns out this is because they are still waiting on players to turn up. I had a clear idea of who was going to win the game before it started. 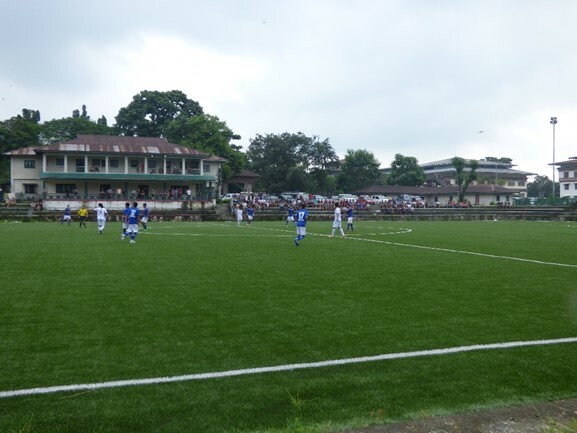 It is a league with six teams, (and hence only ten matches), seven rounds had been completed before I arrived, Phuentsholing had lost all seven and conceded 57 goals to date. 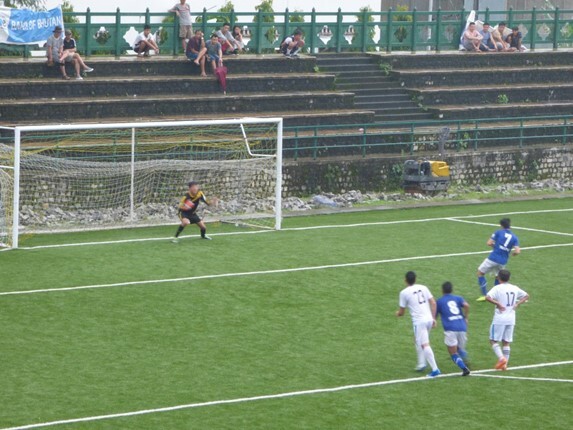 The visitors, Transport United had drawn the opening game of the season with Thimpu United 0-0, and then won all six of their games since. I eventually get to talk to Hishey Tshering, who is both sponsor and coach of Phuentsholing City. Apparently, some of the players had got stuck by an accident on the road from Thimpu (he said they were five short). I am given a list of 12 names, but when the game started, there was only ten on the field. Except the coach, there was never anyone else on the bench, so all of the players stayed on field for 90 minutes, playing in a 5-2-2 formation, and somewhat inadequate. I got more information when I visited the FA offices. 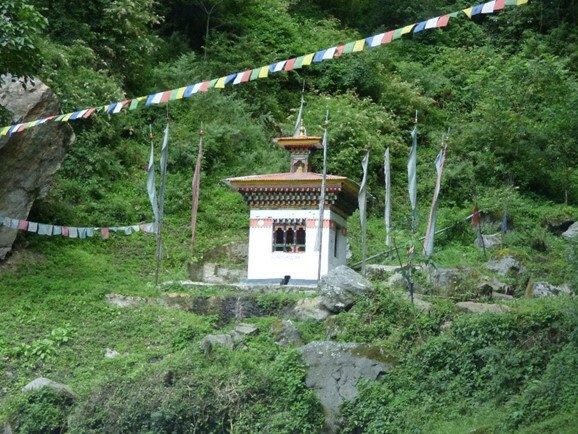 In areas such as Phuentsholing there is no preliminary competition, although they do organise some local competitions. 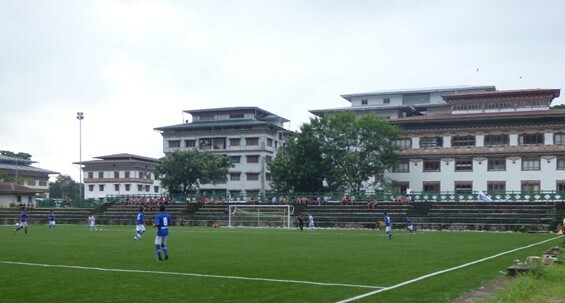 In the main city, the Thimpu league is played earlier in the year with the top three going into the National League. 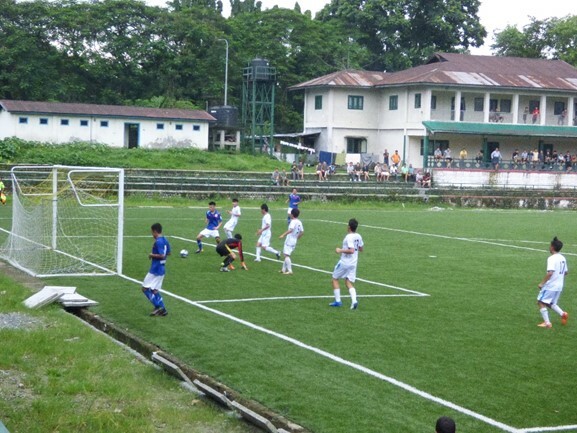 I suspect that if all eight (including Tertons who had lost all 14 games) joined the National League, they would all finish ahead of Phuentsholing. Anyway, players from the five city teams that do not make it to the National League are only allowed to register for the teams outside the city. The three who qualify cannot increase their strength by signing the best of the rest. 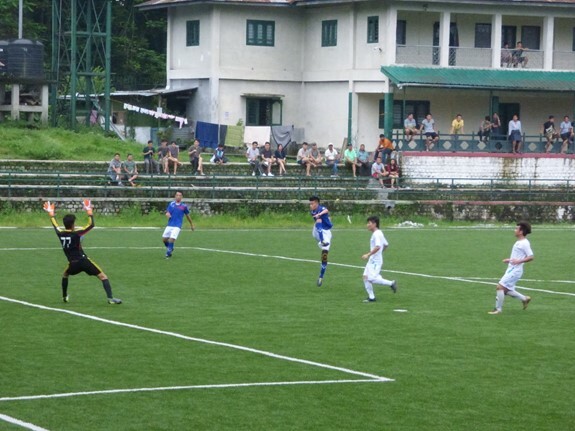 While most of the City League players therefore do not play in the National League, Paro and Phuentsholing each have a few. I am not sure about Uygen Academy, which is also the most competitive of the non-Thimpu sides. 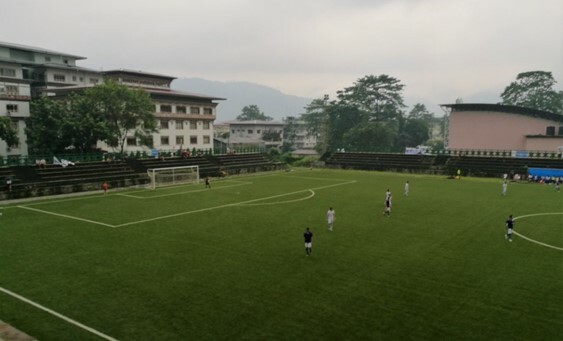 It would appear to be the players from Thimpu who had not arrived for the game. Whether this was really by design or accident is something I cannot say, and I guess now is a moot point. It took 14 minutes for Transport United to score the first goal, and with that, the floodgates were opened. By half time it was 7-0 with Kencho Tobgay scoring a hat-trick. Tobgay completed a second hat-trick in the second half, while Dawa Tschering also scored three. Half time substitutes Sontosh and Wangdi both got onto the scoresheet, while Kingal Gyeltschen and an own goal added in to give a total of 13 away goals. I did an estimated head count, and came up with 270. Naturally the numbers ebbed and flowed a little with it being free admission, and many did not stay until the end, more because it started to rain than because of the football on offer. Hishey Tshering mentioned that his business was a karaoke bar in town, and I suggested to my guide that maybe I would find it for a drink later. He was very quick to advise me against this. In Paro, there was no where I could head to from the hotel, and in Thimpu he was happy to let me wander out on my own, but clearly here he felt that I was best off not doing so. How much this was to do with actual safety, and how much to do with the reputation of the bars in question is open to interpretation. The impression I get is that the much of the business done here is not selling beer. As it happened, I never found out which bar was run by the club manager, and stayed in my hotel anyway. My guide and the driver did not stay in the hotel with me, but went to cheaper digs across the road, and later told me that they spent the evening on the Indian side of the gate. This is the second in a series of posts I am making, which will be extended to create a book, Around the World in 90 Minutes. 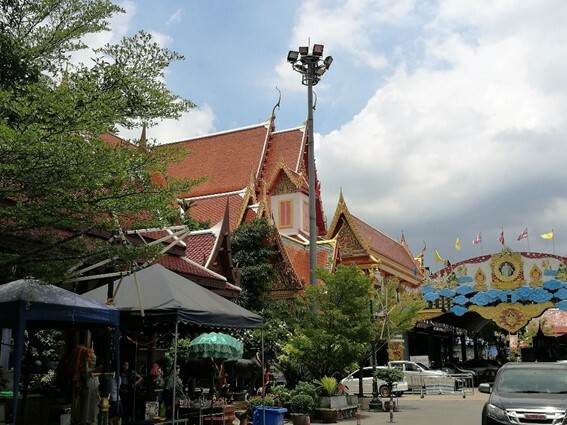 Bangkok may be frenetic, but it is an oasis of calm compared to the first visions that a visitor to Phnom Penh receives. I have had the sense to be met at the airport, by a reasonably priced hotel car. It gives me a final hour of air-conditioned comfort as it waits, stuck in traffic. My hotel room is small, but not bad, I would have appreciated it if the air conditioner there was a little more effective. It is about a 30-minute walk to the stadium, so once I have freshened up, I decide to make my way there. I quickly lose count of the number of tuk-tuks and moto taxis that ask for my custom, but it must have exceeded 100. All the way along the road, even the major roads, the pavements were blocked by shops spreading their wares out, or by parking the mopeds that are the preferred form of transport for all that can afford them. Hence any pedestrian is forced out onto the road. It takes a while to realise why no one cares, there are almost no pedestrians at all here. There is hardly anyone who cannot travel using the transport available. 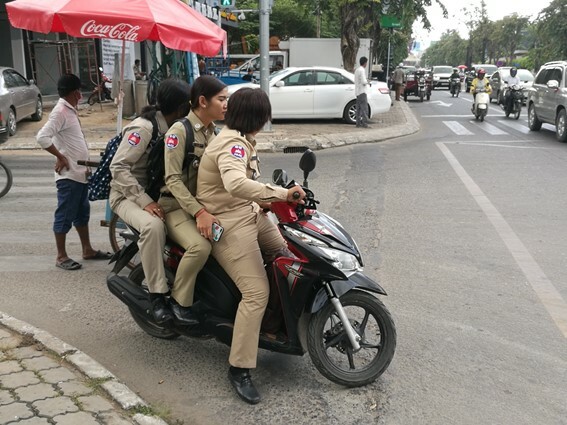 Moto taxis, by the way actually mean riding pillion on the back of a moped, without a helmet, and with a good chance of a (low speed) collision at every junction, so tuk-tuks are my preference. 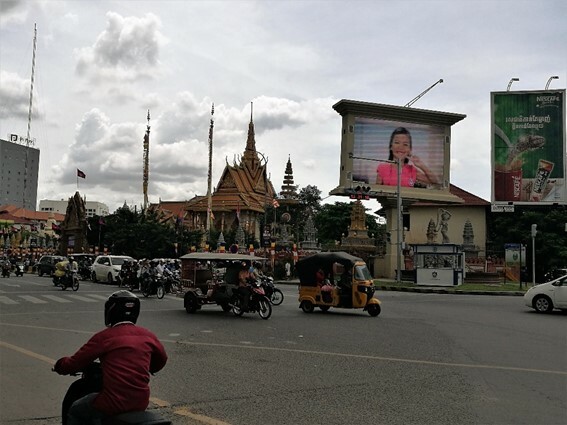 Over the few days in Phnom Penh, I find some of the rules of the road, such as at traffic junctions with crossing signals, the green man means that generally vehicles will only come at you from one direction, and even they will try to miss you. Still, you never get to the point where a tuk-tuk driver believes that a foreigner should be walking. The normally approach you in the few yards between exiting the previous tuk-tuk and entering the building that was your destination. And naturally if they have just seen you walk past and refuse the approach of one driver, they have no reason to suspect that you might say the same to them. Finding the offices of the Football Federation at the stadium, they tell me to come back later in the afternoon to collect accreditation. I use the time wisely, walking again as far as a craft brewery that has a good location between stadium and hotel. After trying their beers, which both good and varied, the smoky porter being the best of the batch, I continued my walk and got back to the hotel. I reckon that’s 97p in English money, and as it turns out, I get the accreditation anyway, and tickets were available on the day. 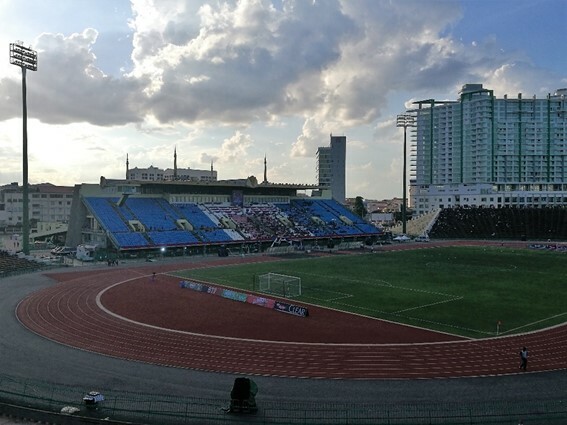 The match is played at the Olympic Stadium, which despite the name was built for the 1963 South East Asian games. These games were never held due to the political situation at the time. The stadium is a fine old bowl in true communist style. One major side, and a giant sweeping curve of concrete seats around almost the whole of the rest. Officially, the stadium can hold 55,000 – with no handrail or crush barrier in sight, it would not hold 5,000 in line with safety standards in Europe. 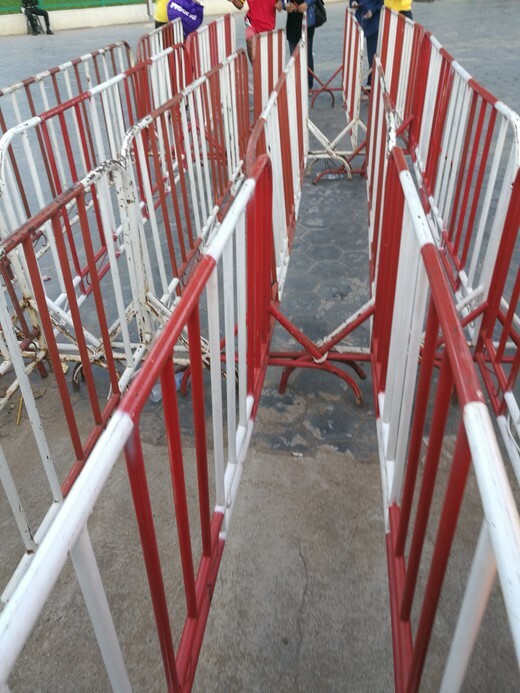 One enters from a low level, and getting in on matchday involves entering through narrow pathways caused by temporary wheeled fencing tied into place. You then have to jump over the joins between the fences. I saw no way for someone who was not relatively capable to get in, and no wheelchair access. From this point, you climb a steep staircase, which leaves you at the top level above all the seats. You can walk around the stadium at this height, and there is a level patio area running back from the seats opposite the main stand, with many food stalls open. 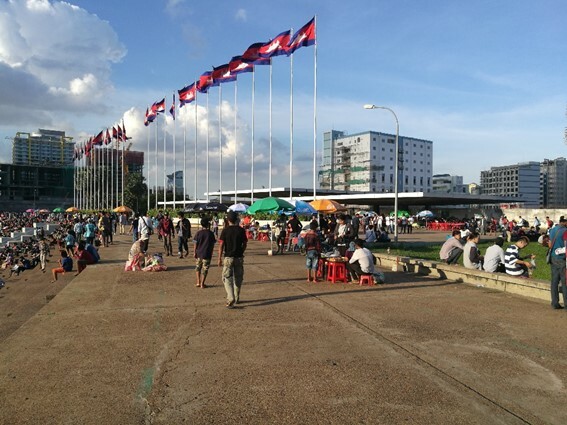 While most of the other large countries within South East Asia have held the games on multiple occasions, Cambodia, having missed out in 1963 still have not staged the event. They have now been given the rights to stage in 2023. However, this old stadium will not be used then, as the building of a new facility to the north of the city has already started. Parts of the edges of the site, (not the stadium itself) have been developed as condominiums in order to fund a refurbishment about ten years ago. 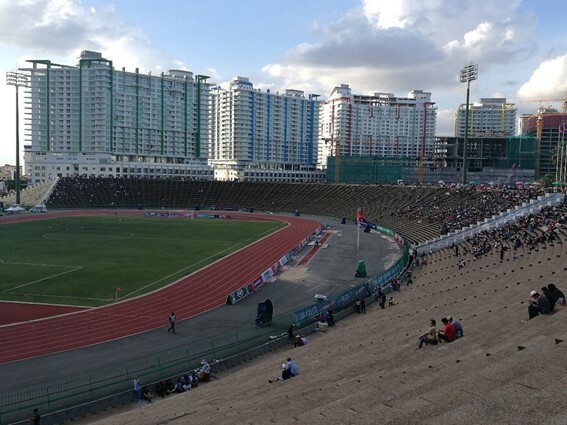 No one knows how much of the stadium will survive once the new facilities are open, but it is popular locally, as a quiet space in the centre of the city. 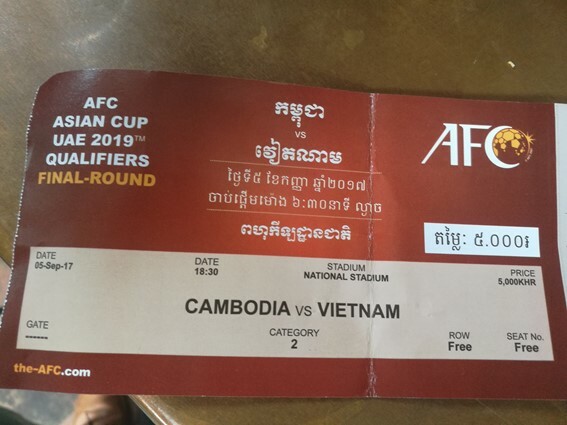 It does not take long for the game to spring to life, in the fourth minute, Vietnam score a goal of stunning simplicity, that makes you wonder if Cambodia are going to suffer a very heavy defeat. It was a chested knock down, and then a straight low shot by Nguyen van Quyet from outside the box. Most of the visiting support if just below me to the right, and they light up red flares and smoke bombs as they celebrate the opening goal. It appears that Vietnam have three centre halves and no full or wing backs. This gives Cambodia an invitation to attack, they push at the three defenders and force a corner. 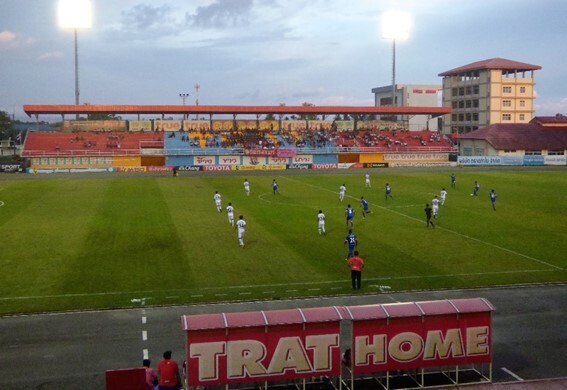 The corner is cleared following a long punch from the keeper, Vietnam race in to attack, four against three, but lose possession and the non-existent defender is easily passed, the ball moved to Chan Vathanaka on the other side, and Cambodia level at 1-1. Now it is the Cambodian supporters that are standing, waving the clappers that have been given away free on the gates as they go. For Vathanaka, it is a relief to be properly on the pitch. Earlier on the season, he transferred on loan to Fujieda in the Japanese 3rd Division, but since has not started a game. It transpires that Vietnam are playing 4-4-2, but that not all the players are aware of this. It only takes 17 minutes for Vietnam to decide to change the right back for someone who might actually play right back. The player going off develops a limp as he exits the field but had showed no earlier sign of distress. The early play, when both on and off the field, the action was as frenetic as the local traffic settles down a bit, and Vietnam look the more comfortable on the worryingly unevenly coloured synthetic surface. On 19 minutes, a free kick from square position by Vietnam’s Vu Minh Tuan bounces off the bar. Cambodia can still cause problems, even if the decision to actually have someone at right-back has settled the visiting defence. Just before half time, Vathanaka gets a clear header which he places over the bar, and as a result we reach the half way mark at 1-1. The stadium is much fuller than I would have expected. I was aware that all the category 1 seats in the main stand had been sold, but I am surprised by the numbers sitting opposite, the crowd is thinner behind the goals, but clearly, there is support for the live game here. I can see a phalanx of insect life attracted by the lighting at the top of the stand, and also a few small bats taking delight in the free meal so provided. The second half was much quieter, interrupted as they all are by substitutions and injuries. Still, Vietnam were gradually taking control, Cambodia were finding it difficult to get across the half way line without losing possession, while Vietnam could get close to the penalty area. An annoying penchant to fire the ball into the area from distance meant most attacks were cleared with ease. 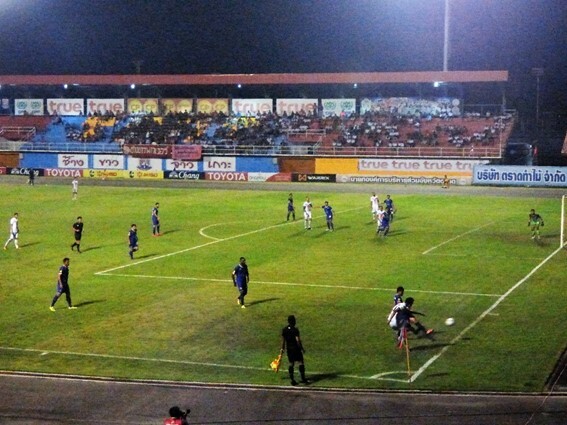 Maybe this was a deliberate ploy, Cambodia were getting used to long balls being fired in, and being able to clear them with ease, but with about ten minutes to play, the ball was crossed from closer to the bye line, and Vietnam’s substitute attacker Nguyen Quang Hai was left unmarked to put them ahead. Cambodia did get back on the attack now, but a dive in the box, ignored by the ref, and a clear offside were their closest options. Still there was enough hope that the board for six minutes injury time was greeted with a cheer. It turned out to be a vain hope as Vietnam had the only clear chance in the period. I turn up at the press conference, mainly because I wanted to try and corner the home officials. While I do this, they do not deliver on their promises to e-mail me in the morning. It was interesting to hear the home coach, Leonardo Vitorino bemoan that he just does not have good enough players to deliver results. Vitorino is one of the legion of coaches that seems to traipse across the world, taking two year contracts with clubs or countries, and normally getting sacked after one or less. Looking at his list of clubs on Wikipedia, it seems shorter than some, with more coaching jobs rather than the top managerial position. He seems to be resigned to the fact he will get his marching orders either as a result of Cambodia’s non-qualification for the 2019 Asian Cup, or due to poor results in the 2018 AFF (ASEAN Football Federation) Cup. The lack of grass across the centre of the pitch testifies to its over use. There are four people in the office, when the only apparent task is selling replica Army FC kit. I am there for about 20 minutes, and they sell four, which I thought was a good throughput. The largest size was L, so I did not buy my own. They had a list of fixtures to be played for the rest of the season at the stadium, but no reference to the full list of matches and venues in the league. When I return to the National Stadium, and the FFC offices, this list is now available. As far as official comments were concerned, it was clear the staff in the offices would not say anything but refer to their chiefs, who were somewhere outside the country. 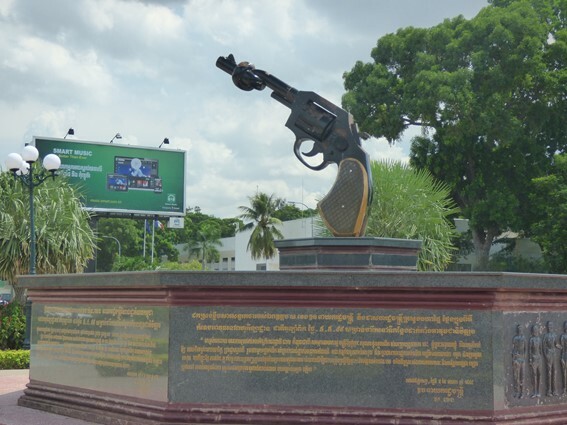 On a roundabout close to the Army stadium is the “Tied Gun” monument. A slightly odd demand for peace? As a response it appears that while the government still considers it OK to lock up the opposition, they are not subject of arbitrary death sentences. However, once you start talking football to people, they soon want to tell you what is going on. So, I managed to ascertain that the Cambodian Football League is semi-professional at the moment – the players may be paid for football, but many have other jobs as well. 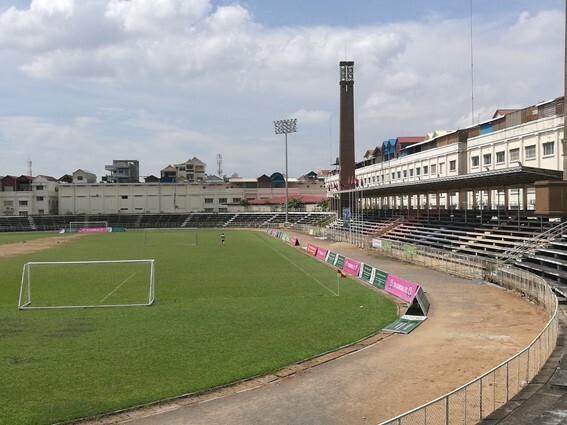 The FFC is trying to persuade some clubs to nominate venues away from Phnom Penh for their matches. This has actually been quite successful, even if only about three venues are currently in use. 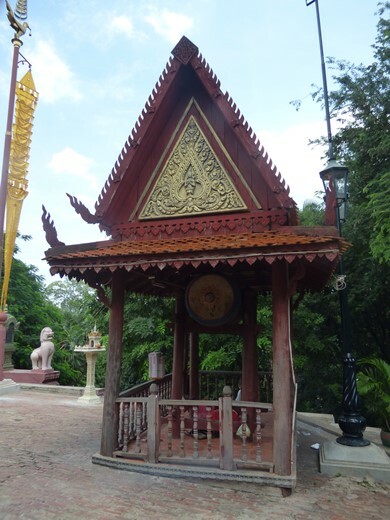 These are in Svay Rieng and Kirivong for teams which include the location in their name, and Siam Reap for Cambodia Tiger. 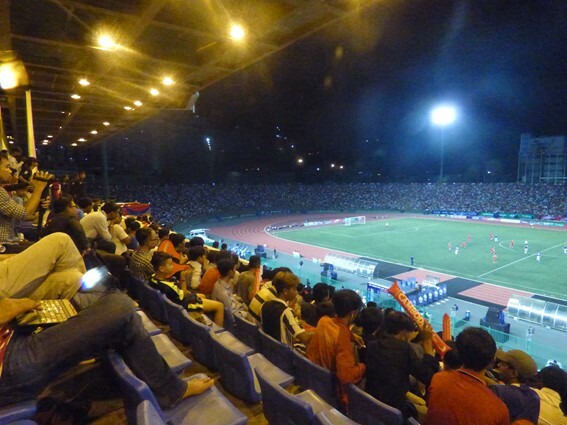 In Phnom Penh itself, there are four stadiums in use, National, Army, Western and RSN. The matches played outside the capital are reported to attract relatively large crowds, in the thousands, as opposed to hundreds. However, apparently all the teams are still Phnom Penh based and train in the capital. They then bus out to the designated city for matches. This is where the FFC sees its next priority, it wants the clubs to not just adopt a “home stadium” as they have now done, but to set up bases outside the city. They can take on youth development work in the areas. Currently, there is no localised coaching schemes outside the capital, and players only have whatever coaching is taught in the schools. This is the first in a series of posts I am making, which will be extended to create a book, Around the World in 90 Minutes. For the foreigner arriving from Europe, heat and humidity is the first problem, so I pushed myself into acclimatisation with a walk to the FA offices at the stadium to confirm my accreditation. It was a full hour’s walk, although I was expecting less. I then walked part way back to the hotel, finally giving in to the desire to take a taxi after taking a few pictures of the local temple. Later, with a heavier bag, I did take a taxi back through the traffic to the stadium. The lengthy jams appear to be part of traffic chaos, but it is relatively organised, except the mopeds and bikes that weave their precarious route through the queues. At most junctions, traffic entering from each direction is given free reign, but then the red lights show for a long time as the other directions get their turn. Many have a timer showing the countdown to the lights change, and the lights are obeyed, although drivers will put their foot down to beat the countdown. 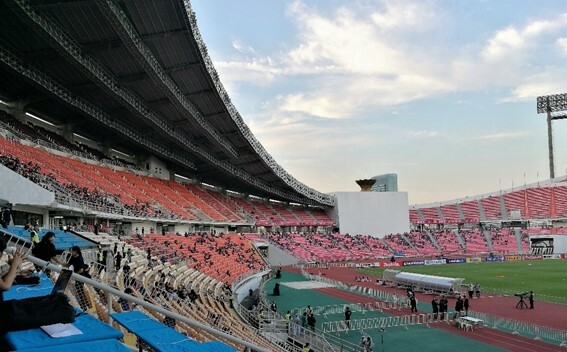 The Rajamangala is a big bowl of a stadium, with the stands quite low behind the goals, where ugly concrete blocks sections for the scoreboard and to hold the flame (from the 1988 Asian games). The stands rise to the centre and really appear to jut out into the night sky. The Thai football team, as a display of respect for the King’s passing, play in a black kit. Despite being bottom of the group, with World Cup elimination already confirmed, there is a fair and noisy crowd supporting Thailand. 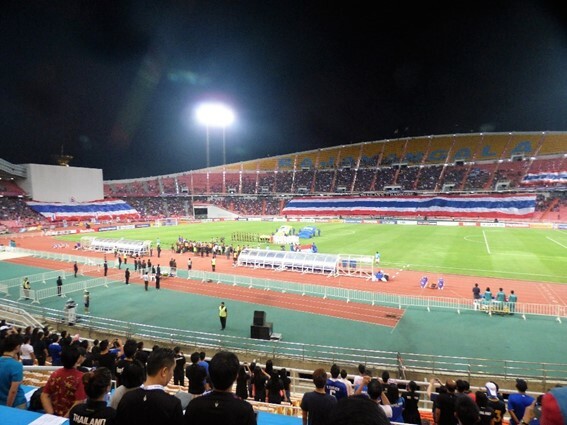 Separate singing sections at each end of the ground, with a smaller one in the middle of the uncovered side, means the noise resounds around the stadium, reaching a crescendo for each Thailand attack. We see a few of these in the first half, as Thailand look the stronger, Teerasil Danga forces a couple of good early saves from Kassid in the visitors’ goal, and later a couple of free kicks come close. But it is Iraq that take the lead, a ball down the right, which is pulled back rather than crossed, leaving Justin Azeez in space. The American born (both parents from Iraq) player shoots for his first national team goal in three years – or to put it clearer, his last since the last time time Iraq visited Thailand. That match, also part of this World Cup qualifying campaign finished 2-2, while my first even visit to the stadium (in 2007) saw the same two teams share a 1-1 draw. The goal against ten minutes before the break is not enough to quieten the home fans, but it does seem to affect the team badly. Thailand came out strongly for the second half, but did not get the early breakthrough they were looking for. Again they were making most of the attacking moves, but there is a question over which passes they elect to try – especially when close to the goal, they seem to believe they can play through the blocking player, when there routes to go round. Thailand equalised with a bit of good fortune. An attempt to clear the ball was charged down on the left, and the ball passed to substitute Tristan Do on the right. His shot is off target, but takes a massive deflection off Ahmed Ibrahim. The Thai support cheer every player going off for a substitution, and they even give a round of applause as Thitiphan Puangchan trudges off after received his second yellow card, meaning his team faces the last 18 minutes with ten men. They have a lesser opinion of their opponents, and do try to affect the referee into evening up the numbers, but he has other thoughts, and no protest on or off the field stops him awarding a penalty, from which Saad puts Iraq 2-1 up. A little bit of gamesmanship creeps in, as Thailand made a substitution to delay the penalty, while Iraq followed suit when Theerathon was waiting to take a free kick. The difference being the penalty was scored, the free kick which needed to be cross drifted into the keeper’s reach. Iraq end up 2-1 winners, which means Thailand will finish bottom of the group. 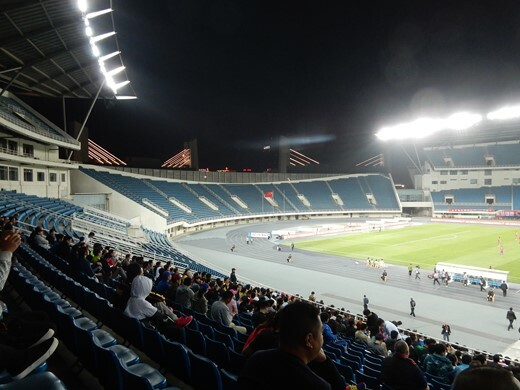 The crowd is 22604, which shows a vast improvement on ten years ago, when only 12000 watched the same two teams in the Asian Cup opener, my other visits in that cup were neutral matches with quite poor crowds. I asked if it would help the team if more of its players could play in other countries. Of the current starting XI, only one (Channathip) is currently playing outside of Thailand, having recently joined J-League side Consadole Sapporo on loan. The captain, Teerasil Dangda is the only other one to have experience abroad. He is one of three Thai players that Shinawatra took to Manchester City when he became owner. As they could not get work permits to play in England, they were shifted out, and Teerasil managed a few games in Switzerland for Grasshoppers’ second team. He also spent half a season with Almeria in La Liga, (the last time they were in the top flight). Suphaphong said “we are trying to give the best option to all the players, we encourage them to go abroad, to make sure they come back with the best experience”. He agreed that the success of the Thai National League works against this. The players can earn a good wage without travelling, so the desire to move abroad is not there. Leaving the stadium, I find a lack of taxis for hire, and tuk tuks are not to be seen in this part of the city. Hence, I take the risk and board a bus. On board, a fellow passenger helps by asking the driver if the drives all the way down the road to my hotel. My original thought was to hope it went much of the way, allowing me to find taxi or walk. As it was, with help, I got to the bus stop close to my hotel. From Bangkok, I make my way to Trat for a Saturday match, with my half way stop in Rayong, also my destination for a game on my return. I feel happy enough to drive outside the city, and the full route I am to take is either dual carriageway or toll motorway. Only in the towns does one have to worry much about the other vehicles. 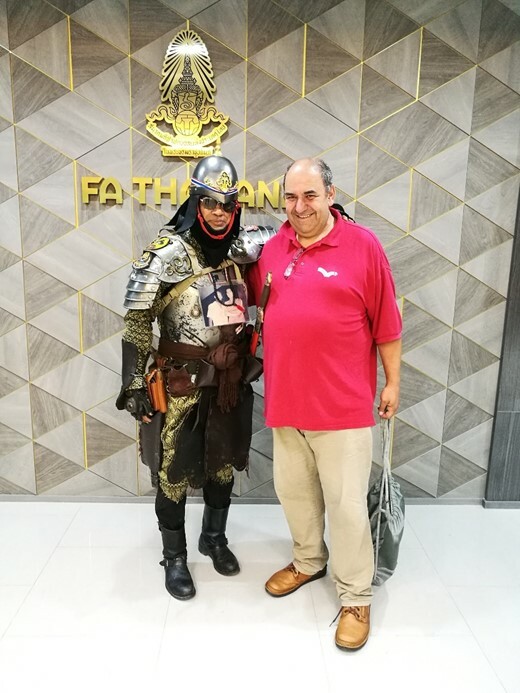 When I visited Thailand on business in the early nineties, the league was not organised as such and instead there was a series of tournaments, one of which was considered to be the Thai Championship. Some of these, including the championship one were played between club sides. 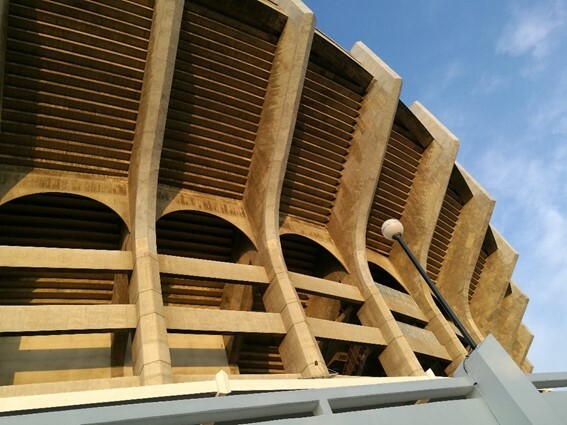 The major tournaments were all played over a period of around two weeks, using the old National stadium. Others were played between Provincial teams, and while the finals of these tournaments would be held in major cities (mainly Bangkok), they could have qualification games in regional centres. 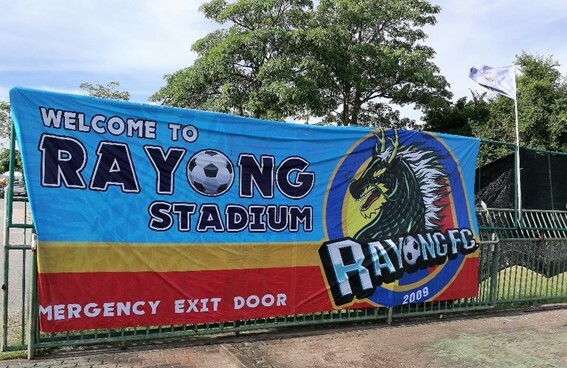 I think I only found out about the one in Rayong because the field it was played on was on the route between the factory and a small resort we stayed in on that first trip. 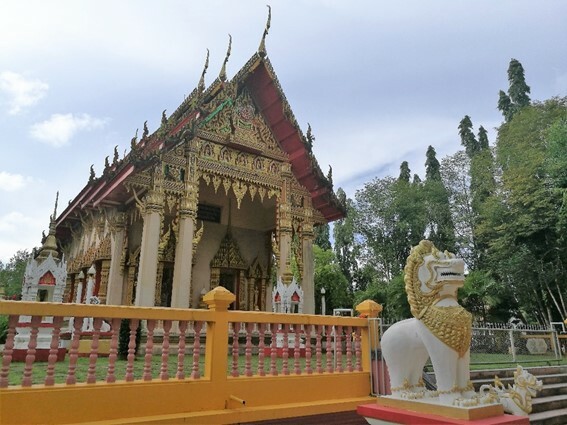 Trat is considered to be the border town closest to Cambodia – but it is still nearly 100 km from the border. It is a smallish town, with several rather splendid temples, and some interesting street lights, which reminded me of Liver Birds. The ground is about a mile out of town. It would be difficult to find public transport as the open mini trucks that serve the locality have no signs, and few speak English, so explaining where you want to go is difficult. The ground is straight forward, a tarmac track, with stands on each side. The home support seems to select the far side, while the small group of visiting fans were caged at one end of the main stand. Both groups of supporters did their best to keep up a chant throughout. The players did their best to keep them quiet. 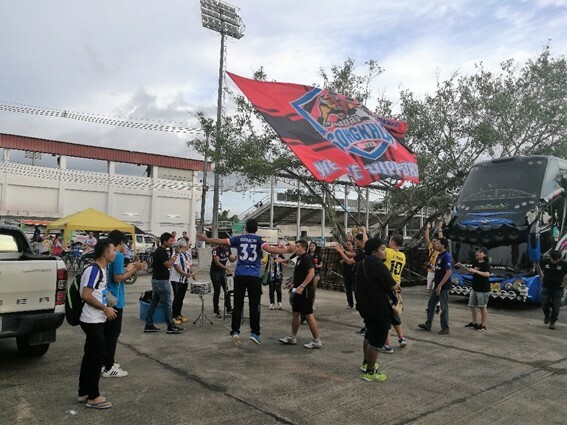 The Songkhla supporters said they had driven from Bangkok, (about 4 hours) which seems more plausible than travelling from Songkhla province in the South of the country, which would take around 18 hours. This fitted in with something I had seen many years back when watch Persija (a Jakarta team) play one from Aceh, from the furthest away tip of Sumatra. Groups of people who have come to the capital for the improved job opportunities look for the chance to gather as a community, and the local football team playing a match provides such an excuse. 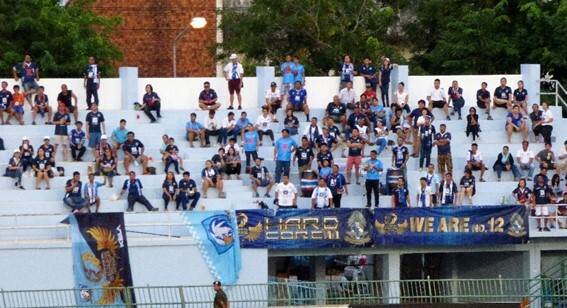 I would think this section of Songkhla support see their team frequently, as the Thai second division is biased towards Bangkok area teams. 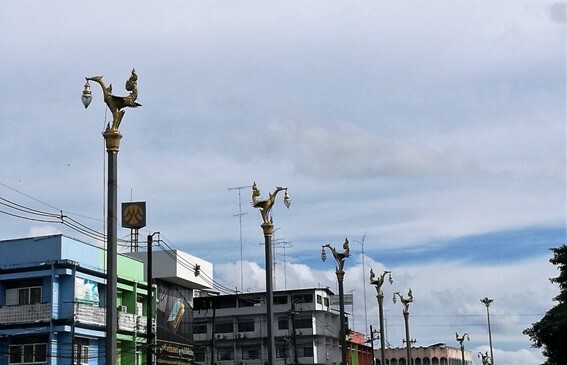 Songkhla have a curious football heritage, having moved from Buriram in the North East of the country after the controversial politician who runs the club now known as Buriram United moved them out of the capital and into is political heartland. 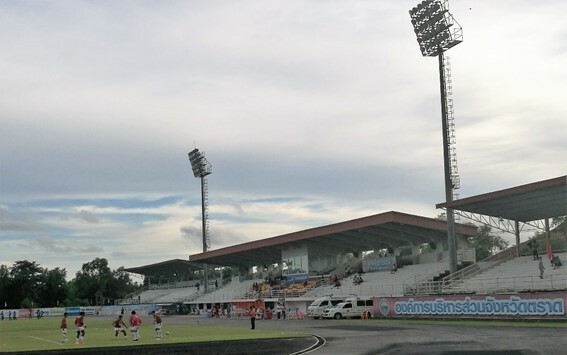 It appears that the owner of Songkhla (then known as Buriram FC) did not object. But then she was (and is) married to the owner of Buriram United. By road, Buriram to Songkhla is 1356 km. Unlike some countries, not only can you sign more foreign players than are allowed to play at any one time, but also you can start with a full contingent and keep a foreign player on the bench as well, only bringing him on after another player has been substituted. I should have asked about red cards in this respect. Songkhla’s Japanese defender Hyun Whoo was not available in the game I saw, being suspended for his third red card of the season. The game started slowly, and while it was clear Songkhla were playing as 4-1-4-1 with all the foreigners in the midfield 4, the home tactic was not so clear. In the end had it down as 4-2-3-1 with a Brazilian as forward, and another as left wide. It appeared that the preferred tactic was to attack down this left wide channel, but the first clear chance in the 16th minute was a cross from the other side. It took a good save to stop Felipe’s header. A few minutes later a move down the left resulted in a hurried clearance. By this time, the visitors appeared to have lost the midfield battle, and could not get approach the home back four with anything other than a single player, the overall pace of the game slow, interrupted by players going down and demanding treatment, and with passages of play. 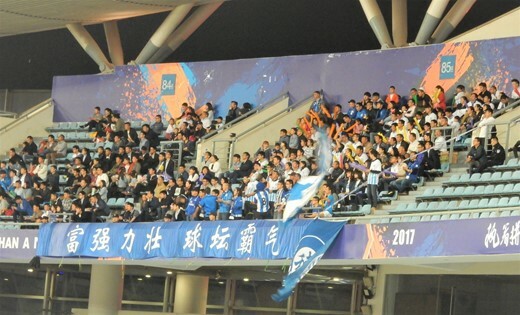 The main group of home fans were in the centre of the stand opposite to the main one. They were almost uniformly kitted out in the same dark shirts, and had a continuous drum beat, with claps and chanting. The away fans, who I had seen in the car park and had apparently travelled from Bangkok in two mini-buses were kept in a secure corner at the end of the main stand. A small group from each side, with flag bearers were introduced from the field at half time. The home side took the lead in the first minute after the break, the ball running down the right side of the field, allowing Tardelli to come in from the other side and glance in a header from a central position. At the end of the game, we see the ritual, each set of players went to receive applause and show appreciation to both sets of supporters, their rivals first and then their own, who would sing at this point. I could not hear Songkhla’s song, but Trat were singing to the tune of “Over the Rainbow”. The following afternoon, I retrace my steps as far as Rayong. 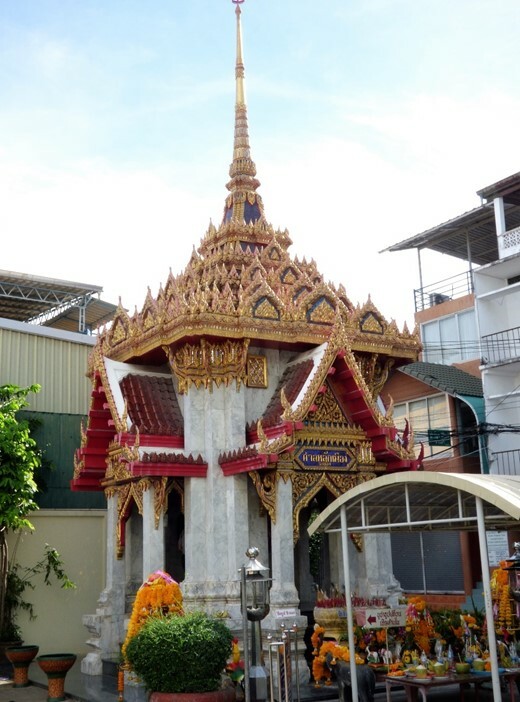 Seeing as I had seen signs and supporters of Trat in the town before the game, but no signs in Rayong on the Friday, I head back to the town centre, after a brief pause to spot a small temple amongst the houses. However, I draw a blank here, there is nothing to show that there will be not one, but two football games in the evening around the city. 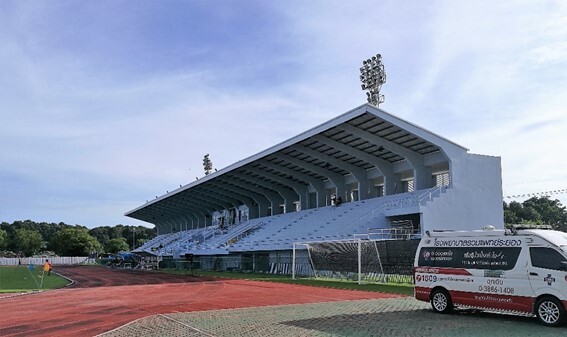 The area around the Rayong Provincial stadium turns out to be the same area as I saw a game in 1990. At that time, there was very little development around here, while now the city has grown, and development continues right up to the stadium. The small beach resort I had stayed in has been replaced by new resorts, and there are now rows of small bars and restaurants right along the beach. There are at least plenty of supporters milling around outside the stadium. I spy three nice young ladies with my name on their T-shirts and get a photo with them. In Thailand, I share my name with a very moderate lager. The open space, on which a marquee erected for the occasion was the only facilities, has been built up into a modern sports complex. The first parts of the construction would have started soon after my last visit to the area. I believe the old pitch is now under a sports hall, while there is also a swimming pool, with a stand for spectators and the main stadium. The track was laid in the mid-90s and looks as if it has not been renewed since. 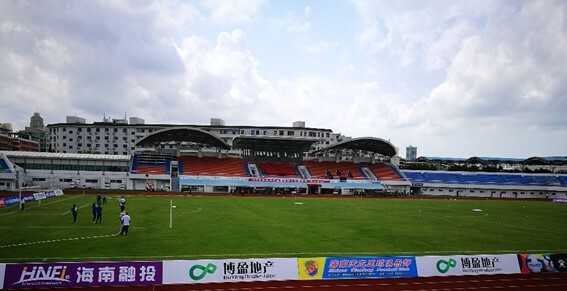 The stands have been updated, with a new covered stand on the west side being only a few years old, while the open seats to the East have been extended at both ends. Almost all the spectators had to sit on concrete seating, but I managed to grab a real seat and move it to the press bench. I can easily walk in free, but at 100 baht, (£2.50), I consider that buying a ticket is a requirement. Rayong are a mid-table club, a few places in the table below. Again, you know the foreign players will be influential, and I think the fact that visiting Air Force Central had more and better foreigners was the deciding factor. 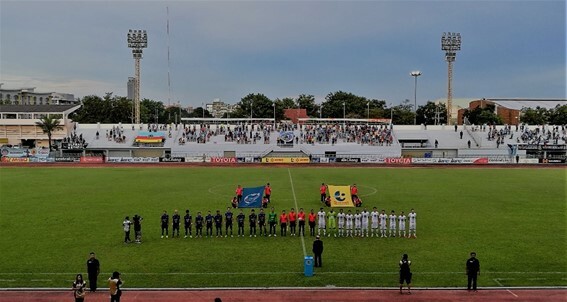 For Rayong, the pick of the foreigners was Seiya Sugushita from Japan, while they also started Harrison Cardoso (Brazil) and Ivan Boskovic (Montenegro), they had a Cameroonian on the bench, but he had no influence on the game when he appeared. Air Force named two Japanese players, along with Bruno Cesar (Brazil) and Aleks Kapisoda (Croatia) – all starting, with no extras on the bench. Air Force make a dominant start, with Bruno Cesar dominating the defenders, out muscling them and hitting the post early, only just failing to get a good contact with the rebound. This persuades Rayong to keep their defenders on him, and the overlook Kayne Vincent on the left wing, who ghosts in to give Air Force a lead in the 15th minute. Ten minutes later, it is 2-0, and this time Bruno is the scorer. Rayong are not out of it though, and a few minutes later we see the skills of the blond haired Japanese Seiya Sugishita as he flicks the ball and goes around his defender, and places a perfect ball for Anuchit to balloon over the bar. A few minutes later, another chance as a header from Nirut is well saved. Once Rayong have possession though, they push upfield and every ball out of defence was a threat, they could easily have scored a third before half time, but again the finishing shot was very amiss. 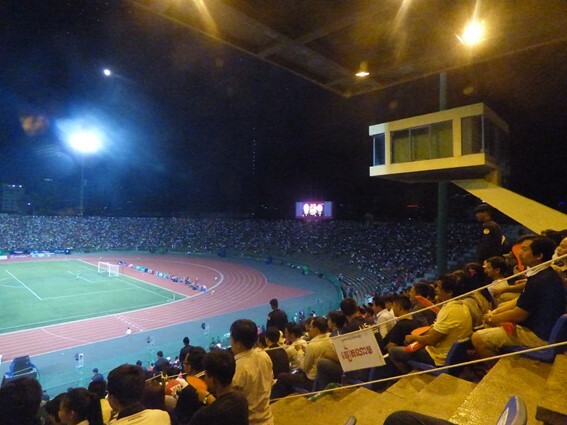 The art of hitting the volley high into the night sky is alive and well in Thai football. As the game moved on, we again got more time-wasting tactics with lengthy injury breaks, and officials that were not quick to act to keep a flow, and only a cursory additional minute added for at least five lost. Even the match commissioner, who left his glass box and placed a seat close to mine appears to agree. 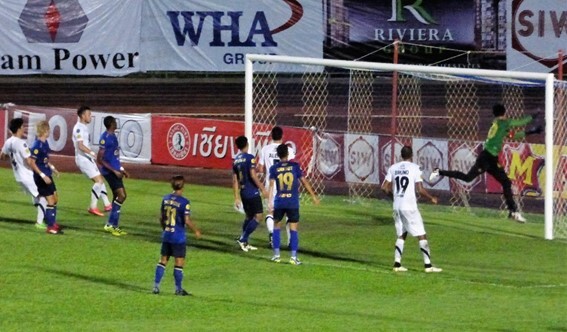 Two minutes into injury time, and Rayong think they have an equaliser. A shot from around 30 yards hits the underside of the bar and down to the ground before bouncing outwards. As it comes away, the nearest player is appealing for the goal, and forgetting that all he has to do is get his head to the ball before the defender to put the issue beyond doubt, and the ball is cleared for a corner. The match commissioner, runs back to his box to watch the replay. I try to follow, but that is not allowed. He comes out and affirms that the referee is correct, and it did not go in. 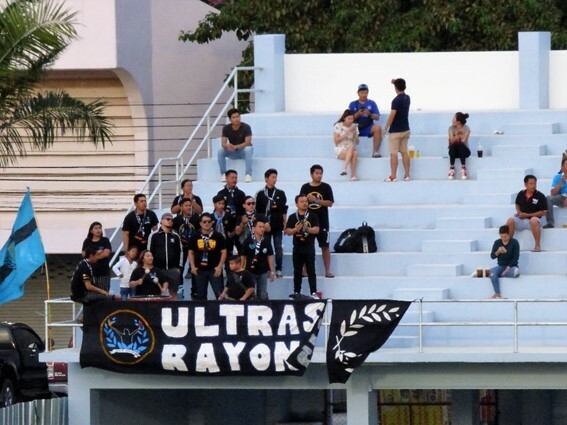 One of Rayong’s Farang supports, Karddin Kent has introduced me to the CEO of Rayong, Adul – and at the end of the game he is watching the replay on his mobile phone, convinced it is a score and that the linesman should have seen it. I tend to agree with the first point, but not the second. The third game of my China trip was relatively straight forward. I spent the morning walking around Nanjing. Far too little time to do the city justice. One day, someone will explain to me. 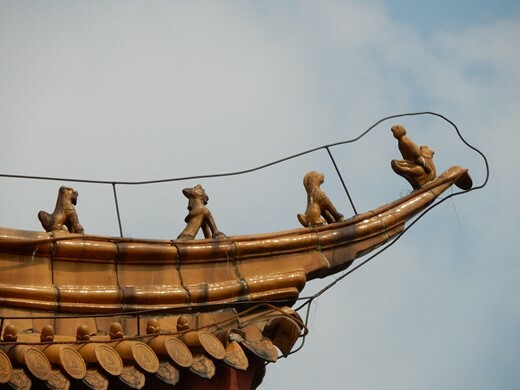 Why do the roofs of Chinese Buddhist have a cavalcade of animals, always led by a man riding a chicken? After that, it was the return journey back to Beijing, with the train again running late, but not so badly as the outward trip. Alighting through the wrong exit (for my purpose), I was presented with a wide pedestrian avenue leading to the main Olympic sites from 2008, with the famous “Bird’s Nest” stadium to the right, had I gone through the security gates and paid the admission charge required to walk around. The Avenue runs along a continuation of the centre line of the forbidden city and Tiananmen Square. My destination was behind me to my right, and even though this meant crossing a major road, it was not difficult to find the way in. I managed to find my way into the West side, but most home fans were on the far side. Meanwhile the visitors had their own section at one end. The stadium I headed to is apparently called Olympic Sports Centre, and is actually the main stadium built for the 1990 Asian games. The best word to describe it would be “functional”. It is a simple bowl of a stadium with two tiers of seats along the sides, one behind each goal. The Asian games were held shortly before my first ever visit to China, and the signs of the changes in the country in the 27 years since are clear for all to see. For 1990, functional was the only way to build a stadium, no bells, whistles, and nothing spectacular. Less than half a mile way sits the “Bird’s Nest”. This and the stadium in Nanjing, along with a large portion of the new buildings in China are not merely functional, they also have the “wow factor”, curves, arches or intricate designs to make them stand out from the crowd. Even more than the Super League match the night before, this game was a matter of passing to the foreigner and let them run with the ball. And therein lay the rub, which decided the game. Beijing Renhe, the visitors started with three foreigners on the field, Ivo is a Brazilian who has been plying his trade in Asia for five years, firstly in Korea, and then in the China Super League before dropping a level. The Ecuadorian Jaime Ayovi has spent most of his time in Mexico, and has only switched to China this season. Ayub Masika is also new to China, he is Kenyan, but has been in Belgium since he was 13, and has played for Genk and Lierse in the top division there. By contrast, the home side started with just one foreign player, Cheick Tiote who is better known in Britain, having played 138 times for Newcastle United. It is not that they could not have fielded more, they also had Rubin Okotie – born in Pakistan with parents from Austria and Nigeria. Okotie is an Austrian international who has played in both Austrian and German Bundesliga. Okotie was on the bench. Their third foreigner was the Nigerian Leke James, who was playing in Norway before moving to China, but he was not in the day’s squad. They also had two Taiwanese players in the squad list, with one, Chen Hao Wei, an international for Taiwan on the bench. Under Chinese rules, players from Taiwan or the Special Administrative zones of Hong Kong and Macau who signed before a certain date are not counted towards the foreign players count, although new signings from these territories will. Ayovi was to score the first and last goals in the 4-0 away win, Ivo also was on the score sheet and Masika almost was as well. However his shot was blocked by the home keeper and bounced out allowing Shi Lian an easy stab into the net. The Renhe tactic was simple, with the two forwards being foreigners, and Masika on the right wing, they would boot the ball as close as they could get, and then let the trio play the ball amongst themselves. 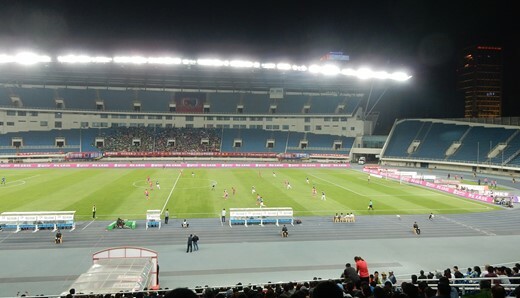 Beijing BG brought on Okotie at half time, and Chen Hao Wei midway through the second half. This made a difference, as in the last 20 minutes, they played some decent football and certainly were good enough now to stop the visitors from increasing the damage. During the second half, I was talking to a New Zealand/British expatriate, who has been in China for some time, watching football there and in neighbouring countries. It was from him that I was explained the dealings with the scalpers. He also explained a little about the running of Chinese football. While the observations may differ from those that a Chinese official may give, one cannot help but believe that they have a ring of truth behind them. Firstly, consider the math. 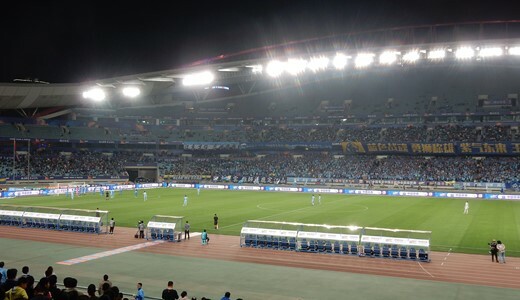 I was in Nanjing for the Jiangsu game, and the crowd was 30053. Ticket prices were between 100 and 200 RMB, so if we assumed everyone paid, (and we know that is not the case), then maybe the income from ticket sales was 150*30,000 = 4,500,000 RMB. Multiple it by 15 home games per season and we get to 67,500,000 RMB – less than £7 million. None of the clubs are taken much more from each game, the TV deals are not adding the sort of sums we see in the UK, and so the transfer fees and wages paid far exceed the incomes. Reports such as this one, [url]http://www.atimes.com/article/chinese-super-league-global-sports-star-heavy/[/url] indicate just how far the wages and transfer fees in Chinese football are slewed towards a few (almost all foreign players). In China, politics is everywhere, the big companies that are putting the money into the Chinese football clubs to pay to bring these foreign stars into the game are not doing so because it is fashionable, or because their owners just love football. They are doing it because the politicians that run the country currently think that football will be good for the country, and in return for supporting this aim, they will get their rewards. The buying into European football, another small dent in China’s massive budget surplus is also not just the play things of rich men, but backed by government policy. Only the slightly strange choice to buy into Midlands football, as opposed to other regions cannot be explained in this way. President Xi has announced the football policy, that China should be capable of winning the World Cup by 2050. With no elections, China can afford to take the long-term approach, but patience will run out if they do not show improvement soon. It is easy to imagine that China will be bidding to stage the World Cup in 2030 or 2034, and they will expect to make a much better fist of it than the three defeats that they suffered in South Korea, their only appearance at the finals to date. However, one does wonder about the logic they are employing. By all means, bring the stars into the Super League, get some publicity and raise the game at home. But China is a big country – the 16 Super League teams represent only 13 cities, and national TV coverage is limited. There is little publicity even for the second division, while the third level remains completely anonymous. China is a mobile phone happy country, with the (permitted) social media and internet news now far outstripping print media, but searches for lower division and amateur football, even using Chinese search engines provides little information. 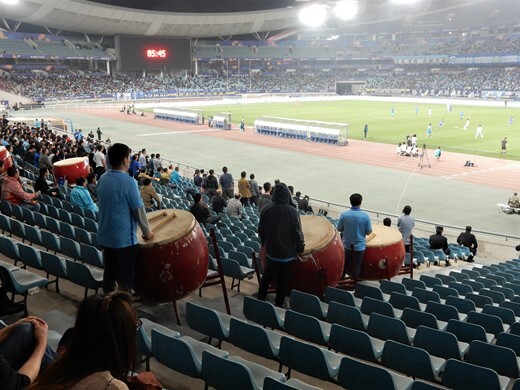 The level of football and fitness at Haikou was very poor for what purports to be a professional football team. If China is to up its game, it needs to overhaul its structure. 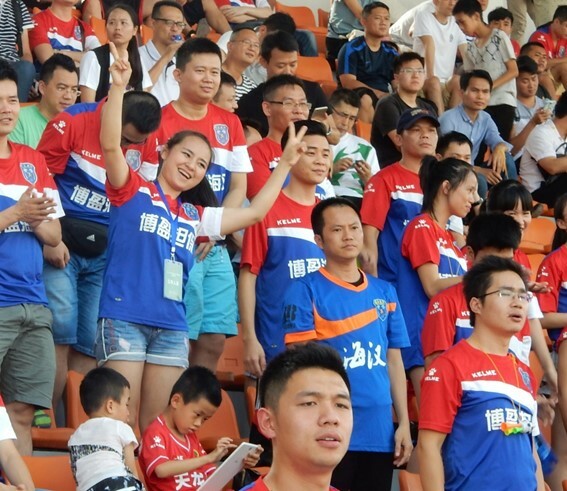 Chinese footballers in China may earn only a little, compared to the foreigners, but it is still enough to keep them in China, rather than searching for opportunities further afield. Only one of the current international squad plays outwith the country’s borders. From Hainan Island, I travelled up to Beijing. The flight up was a nightmare with a four-hour delay, and a serious lack of information at any time as to causes of the delay and when the flight would actually depart. At the airport, there were continual announcements that this flight and that would not meet its departure time, but without reasoning or new times. My wife has a house quite close to the airport, and by the time we arrived there, the first light of morning was already coming through. 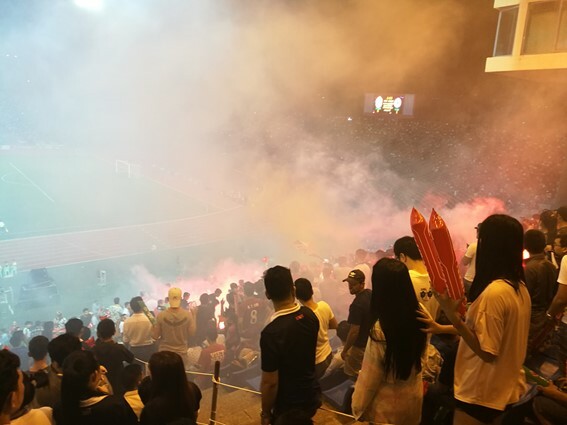 Having discovered that my wife did not need my help on a business meeting, I suggested I could travel to a Friday game in the China Super League before heading back on the Saturday for a Beijing derby in League One. On other sections, we appeared to go quite slowly, and ended up with arriving at Nanjing 70 minutes behind schedule, which was a problem for my plans. I was intending to go to check into my hotel first, and then to arrive at the ground anything up to an hour before kick-off. Instead, I had to get a taxi to the ground directly just to make it within 30 minutes of the start. Fortunately, the good offices of my wife had made contact, to find an English-speaking official who met me and saw me into the ground. I did not pass any of the ticket sales points between leaving the taxi and entering the ground, so without this help, I may have struggled to enter before the start. 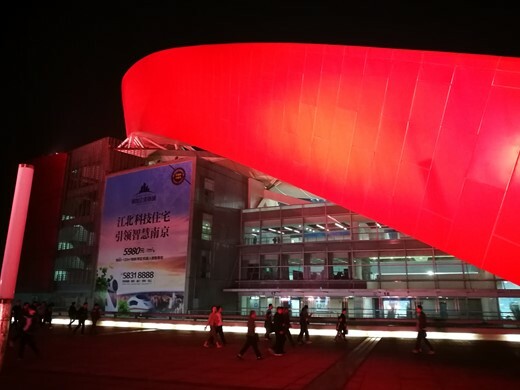 The stadium looks spectacular from the outside, thanks to two red arches, which lean back at 45o painted in bright red, which just accentuates the effect. It is the centre of a sports park, including an arena, swimming pool and tennis centre. It staged the Chinese National games in 2005 and the youth Olympics of 2014. Inside, we have a fairly standard stadium with a track, and two tiers of seats all the way around. On both sides, there is a third tier, which increases in height towards the centre. However, the forward section of the lowest tier has only a low rake, with the front row barely above pitch height. Add in the track and the benches, and the views are quite restricted, especially on the west side of the ground. 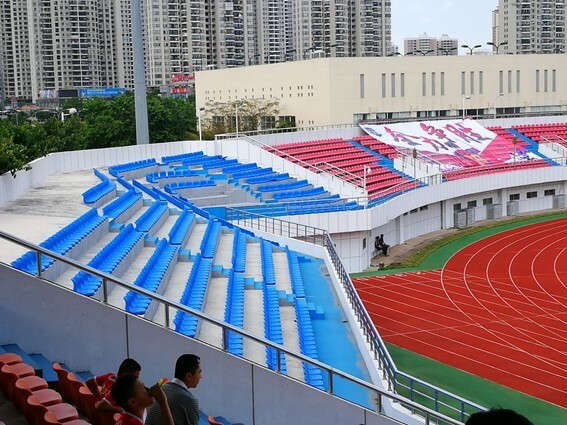 My recommendation to anyone else visiting the ground is to take seats on the East side, where at least there is nothing to block your viewing (and it is 50 Yuan less). From my position, it appeared that the rake on that side was greater, but this was probably an optical illusion, possible due to the much higher numbers of people standing over that side. The main section for the singing fans was in to the north of the East stand, although there was also a section behind the North goal. I noted that these used different styles of flags, perhaps a more independent group of fans, as the main section had flags that reflected (and were probably supplied by) the corporation running the club. 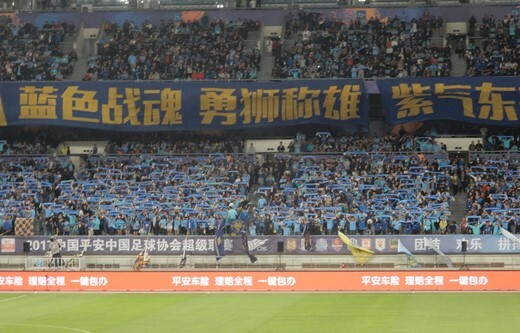 Chants referred to both parts of the name, Jiangsu (which is the province) and Suning (the owners). On my side of the ground, there were six traditional large Chinese drums, which blocked the gangways and were used only sparingly. 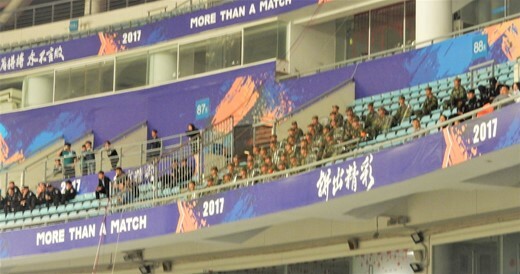 High up in the upper tier of the South East was a group of Guangzhou fans, outnumbered by the police and army who sat in the blocks between them and home fans. Both sides fielded three foreigners from the start, although as it happened, both took one off at the break. The Chinese FA changed the rule for number of foreign players just ten days before the end of the pre-season transfer window, catching some clubs out. Some were in the process of negotiating further signings and suddenly found they were on the limit. Jiangsu have four foreign players on their books, but can only play three, with the Columbian international Roger Martinez as the man left out. They played Hong Jeong-Ho at the centre of defence, Hong is a Korean international who was playing for FC Augsburg in the Bundesliga when I watched them two years ago. In the midfield, they had ex-Chelsea player Ramires, who set a Chinese transfer record when he signed in January 2016. This record was broken twice in the following ten days, the second time to bring another Brazilian, Alex Teixeira to Jiangsu from Shakhtar Donetsk. Before Jiangsu signed Teixeira, he was reported to be a Liverpool target, but they shied away from the asking price. For Guangzhou R&F, there are five foreign players in the squad, (if you have five, one must be from an Asian (meaning AFC, so including Australia) nation). You still can only play three, so the Korean Jang Hyun-Soo and the Brazilian Renatinho were not played. A second “Asian”, Apostolos Giannou was one of the forwards, Giannou was born in Greece, but qualified for Australia as his family emigrated there. It appears he has taken time to decide where his affiliations lay, as he played for Australia at under-17 level, and Greece at under-19 and under-21. Greece named him in squads a few times at full international level, and finally played him as a substitute in a Friendly in November 2015. Despite this, he could still transfer, and the following March he played for Australia in a World Cup qualification match. To date he has five caps for the Socceroos. In midfield, Guangzhou played Junior Urso, a Brazilian who had played in his native country until 2014 when he joined Shandong in China. He moved to Guangzhou this season. Finally, and most impressively, they have the Israeli, Eran Zahavi. Zahavi has played most of his football in Israel, appearing for both Maccabi and Hapoel in Tel Aviv. A short spell with Palermo in Italy was not a success. He moved to China last summer and impressed immediately, so much so that Shandong wanted to take him on, which would have been the biggest transfer fee ever paid for an Israeli. 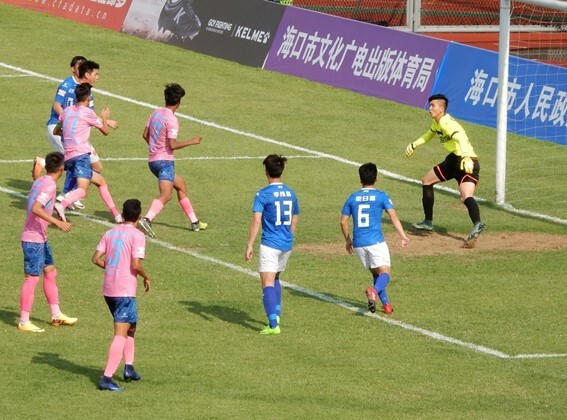 Both teams played in a 3-5-2 formation, although they differed slightly in that Jianye Lui at centre midfield for Jiangsu was playing a holding role, while Junior Urso, in the same position was much further forward. Suning played in an all sky-blue kit, apart from a narrow dark blue strip on each side. R&F played in dark blue. Guangzhou were well on top in the opening exchanges, with the best chance falling to Zahavi who blasted the ball over the bar. 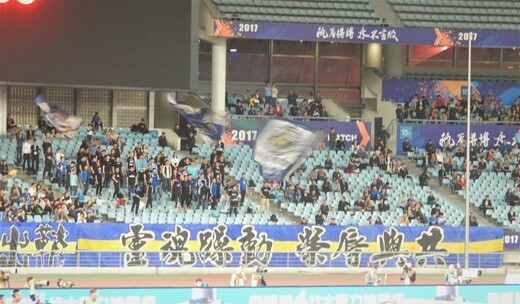 Guangzhou seemed to playing the game of get the ball to the foreigners, while Jiangsu were using their home players better. The target for much of their play out of defence was left wing back Haiqing Cao. The tactic brought Jiangsu more into the game, and it appeared that Ramires, in midfield could be the key player. 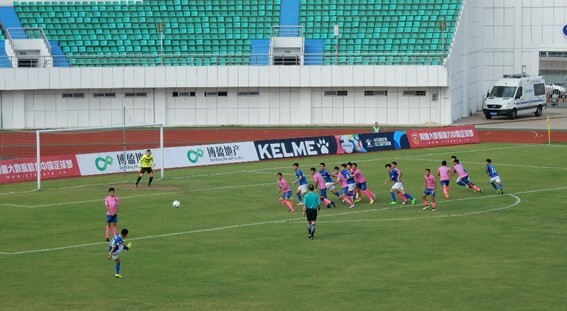 Mid-way through the half, they changed the attacking partner of Teixeira from Tianyi Gao to Xiang Ji. This appeared to be a popular move, and was listed in reports as a tactical substitution. If so, then I am not convinced by the tactic. One of the regulations introduced for this season is that every team must start the game with a (Chinese) Under-23 player. There is no rule that states how long he is on the field for – Tianyi Gao is an U-23 player, and he has started every game for Jiangsu this season, and been substituted in every game. At least he has averaged almost 45 minutes per game. Some of the young players have been removed from the field within ten minutes of the start. 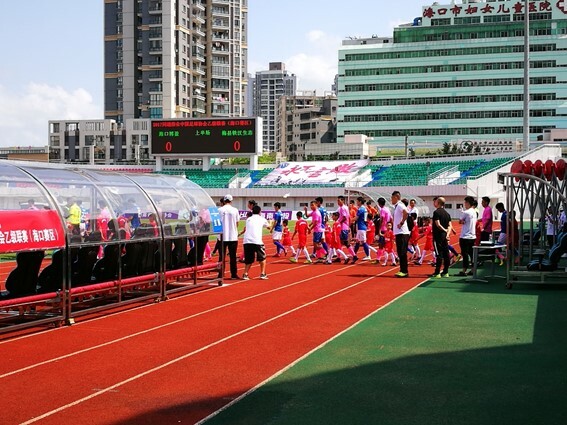 Other teams are more serious about giving (at least one) youngster a chance, for Guangzhou R&F, their young player was Huang Zhengyu who has played in all seven games this season, and not been substituted once. The concourse at half time, looking as spick and span as any shopping mall. Fans behind the goal used different flags to those at the side of the ground. After the game, I found my hotel after some difficulty with the taxis, and later went out to what is known as the 1912 district. While having a degree of night life, and popular with locals, it does is not what is says on the can, evocative of the China of 1912. 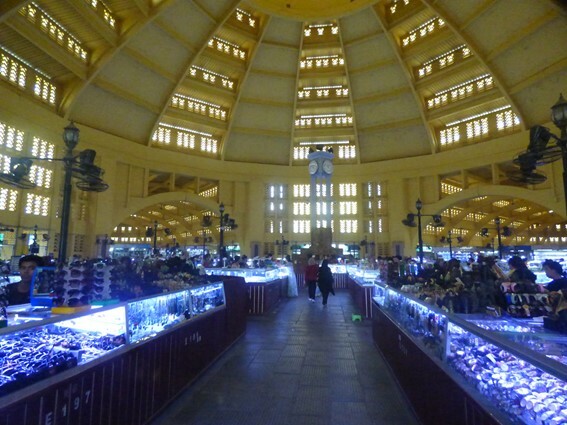 Instead it is a modern cluster of cafes and late night discos. There are plenty of options to eat, the best of which are almost certainly just outside the “zone”, where prices are lower and anything that has ever swan appears to be available. I just wanted a beer, and there are few options here, although I eventually stumbled on a bar which not only had a massive selection of imported beers, but could also offer a local craft beer. In the morning, I tried out the local metro and went on a quick trip into the town. 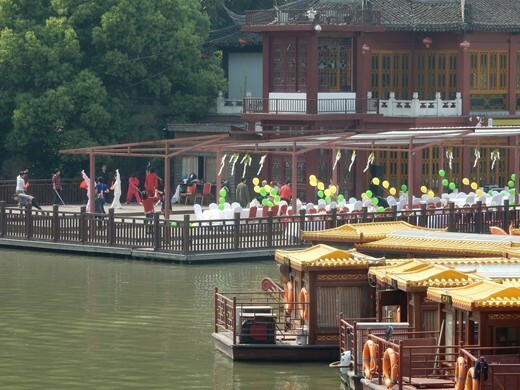 With only three hours at my disposal, I had intended to find the Confucian temple, but instead ended up in the pleasant surrounds of Egret Island. This is one of the confusions that can occur when touring without a map. I knew I was close to the temple, but despite signs and maps indicating its location, and it being quite a large complex, I never actually walked towards it. 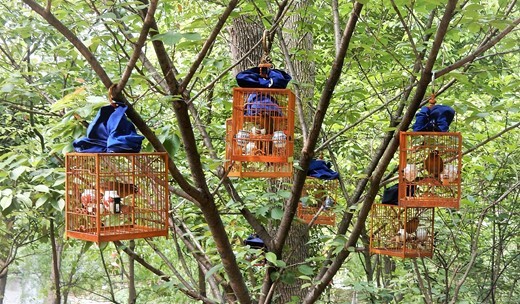 The area I was in is popular with locals, and is a more genuine slice of China, a place where people can take their caged birds out for a walk, or practise their morning Tai Chi exercises. I am staying at an apartment on a new complex in the Clearwater Bay Tourist zone, Lingshui County. They have a daily bus to Lingshui station, so I started my day on this. The first thing to do is to queue for a ticket. The queue is about 30 minutes long. It is quite simple to ask for a ticket to Haikou East Station (the end of the line), but I then show them the time of the required return train. They happily issue a ticket for this, but take away the original. No amount of persuasion seems good enough to get two tickets, and by the time I have secured the outward ticket again, it is for the next train. Fortunately, only 20 minutes later than the original. Note to any travellers heading to China, you need to show your passport to buy a train ticket, which I think means that foreigners cannot use the automated machines, even if they can understand Chinese. The Chinese have ID cards with a RFID*1 tag allowing them to use these machines. You then have to go through security. A guard checks your ticket and passport, and stamps the ticket, allowing you into the waiting area. There are ticket readers as well at the gates to the platforms, and these only let you in after the system has declared the train as ready to board. Only one train will board at a time, so we cannot move until after boarding has finished for a train the other way. This may sound carefully regulated, but in fact it is regulated chaos. In each of the queues, there are people pushing in at various points. 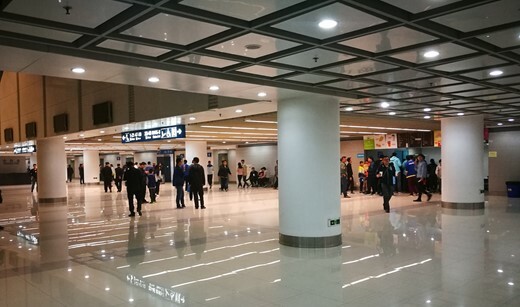 Many of the people waiting for tickets at the station have complex journeys involving a change at Haikou for a ferry and then onward travel. Meanwhile others wish to push into the front, possibly to collect pre-ordered tickets for a train that is about to depart. Even when entering the platform, people still queue jump. It’s the local way of life. There is no point in queue jumping here, because everyone is going to go through, and has a specified seat on the train. At least, I thought I had a seat, but when I looked, I found I had a carriage number and no seat number. I was soon told that was because seats were sold out and I had to stand. There were a couple of empty seats, so we used them for the first 20 minutes, but these were claimed at the next station. We then pushed on down and found that while our carriage was all reserved, the next one was half empty, and it was easy to get a seat. b) I wanted two tickets, one for myself, and one for a child – as per the two people queueing and the two passports handed it. The result was that half way through the transaction, someone pushed in from the side (almost certainly ignoring the whole 30 minute length queue) and demanded service. We then had to wait as this was dealt with (at some length, it wasn’t a language issue, everyone seems to have problem at a Chinese railway station). At least we did then get our tickets issued, with people now approaching the window from both sides requiring a “push in service”. Even then, I discovered that the tickets issues were seats B/D in a row – this is the middle of a group of three, and the seat the opposite side of the aisle. Time to finally leave the station. I immediately spied the tourist information booth. Certainly a chance for more fun. I picked up a local map, all in Chinese, and asked about the location of the football ground. 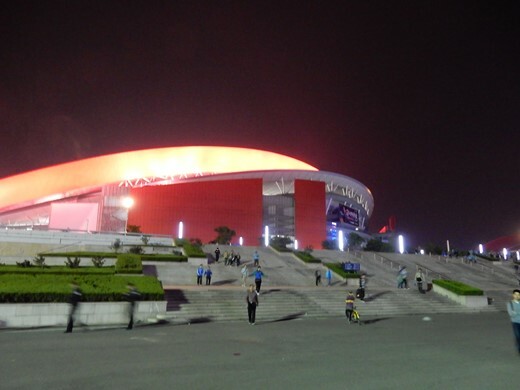 I had the name of the team and stadium in Chinese on a web site, but the girl had not heard of either. Her first comment was it was not in Haikou at all, and then when pushed circled a point on the map quite a distance from where I thought the stadium would be. 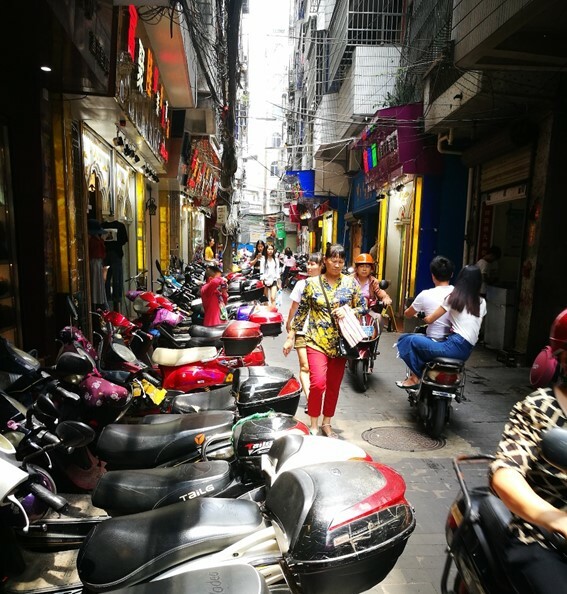 Haikou streets, (renaissance town). Beware of the Moped – although at least here the average number of riders per moped in under 2. I only saw one with four people on it. After this, she called over two other members of staff, had a conflab and decided that the location I had asked about was in fact the correct place. We spent a small time in the old town, or renaissance town as the tourist girl insisted it was called. It was not possible to see a lot with a seven year old in tow, so I asked a taxi to take us to the ground. With the return to the station later, I had three taxi rides in the city, all took about 30 minutes, with about half the time stuck in traffic. All somehow managed to avoid the chaotic phalanx*2 of mopeds that would swarm across every road junction when the lights changed. All charged a little under 30 RMB. The good news was the ground was where I thought it was. I had arrived close to the East side, and this side had uncovered seats over the full length. The uncovered seats stretched around curves behind both goals, (this being a stadium with a running track), with cover only on the West side. I could have wandered up any of the staircases and taken a free seat on this side, but I just wanted to walk around. 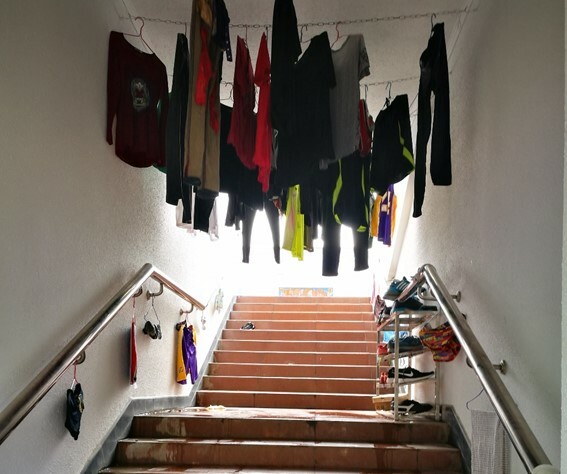 I did make a quick investigation, and found wet washing hanging above the staircase. On the South and West sides, where the ground meets streets, there are a number of small shops and restaurants, and in one corner they are given over to medical services, (probably in connection with the hospital opposite). Seeing one next to a gate to the ground, I looked to see if it was an entrance, but it turned out to be a massage parlour (of the strictly legitimate type). On the road side of the main stand, we spied the ticket sales. This looked straight forward, but at the first point, they were issuing receipts and taking ID numbers. It turned out that at this point, they were selling season tickets, and I needed to walk a little further for a day ticket at 30 RMB (£3). The child was free, and also got a free mini vuvuzela with which he (along with many other kids in the ground) could make annoying noises for the rest of the day. Hainan is the smallest province in China, only about 1.5 Wales in size (using the well-known international measurement), with a population of just 9 million. My train journey was 242 km (similar to Cardiff to Rhyl) and took 80 minutes. Hainan Boying is the provinces only fully professional football team, and I would say 90% of the population do not know they exist. The ground itself is modern and neat. Most of it has around ten rows of seats, with cover only on the west stand. With the lowest row being around 5 metres above the ground, the viewing lines are good from most seats. Considering that this was the first league match of the season, the pitch had surprisingly bare patches in both goalmouths. 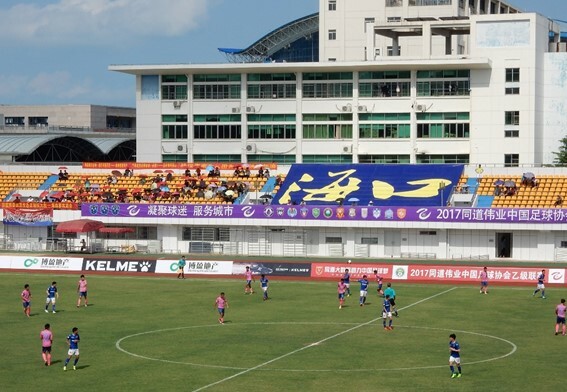 The ground apparently belongs to Hainan Sports Academy, (who are likely to be responsible for creating the washing hanging in the gangways), and must see use throughout the winter. 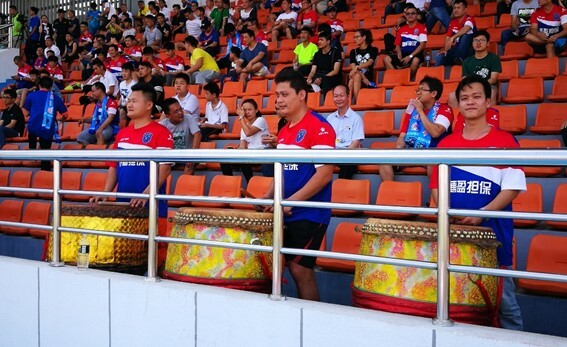 [Hainan is a great winter destination for a holiday, but football supporters should note this was the first league game of the season]. The game was poor, both sides playing in a 4-2-3-1 formation, but then bypassing the midfield with long balls and hoping the defenders made a mistake. The trouble with this is that there are more defenders than attackers, and so someone covers for the mistake, whereas any failure by the attacker leads to the ball launched in the opposite direction. 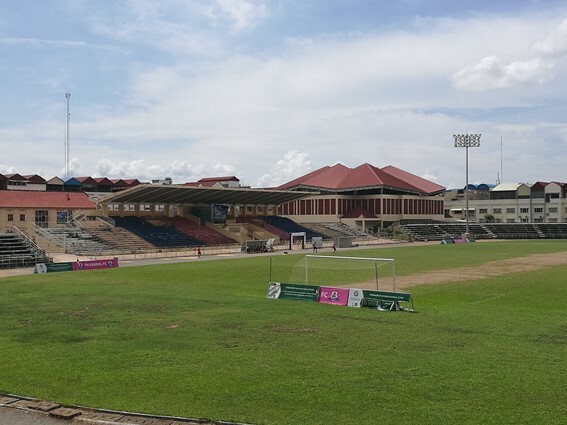 The temperature was around 30oC, and it will have been warm in the sunshine on the pitch, but it was still a bad sign that the players, who I am told are full time professionals did not have the stamina for a 90 minute game. Still we did have one good moment, just after the hour when Zhoa Huang swung in a long free kick from the right, evading the defence, it found Sun Xi Cun coming in at the far post, to score the only goal. 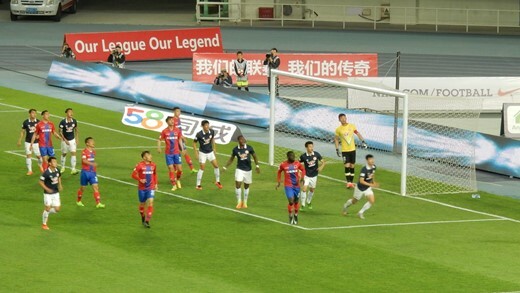 Within the next 12 minutes, the home team had made all three substitutes and switched from 4-2-3-1 to 5-3-2 with at least eight players behind the ball whenever Meixian had possession. Blatant timewasting was also the order of the day, ending up with an “injury” after the board indicating five minutes of injury time allowed. It took over a minute to restart play, and no surprise that none of this was added on by the referee. There were about 40 or 50 fans out in the sun opposite the main stand. I realised late on that these were away fans. If Meixian (based in Meizhou) even has an airport, then it must be 90 minutes to two hours flying time from Haikou! Away fans are fully equipped with umbrellas. I managed to corner a couple of club officials who had limited English after the game, noticing as I passed that the after match press conference was packed full, despite my earlier recollection that there were no actual press benches, or anyone visibly writing notes as the game progressed. Considering the crowd was only around 400, (I suggested 500, but they said I was over estimating), they confirmed these were fully professional, and basically reliant on the money from their owners, Boying to exist. They were not at all surprised how few people I had found that knew of their existence, but it did not seem to bother them a great deal. Meanwhile, just six weeks earlier, the Mission Hills Golf Club, close to town announced a link up with Barcelona to run a soccer academy. Former player Ronaldinho had visited and met a group of kids, all well kitted out in Barcelona kit for the opening. Somehow, one finds it hard to believe that whatever goes down at Mission Hills will ever be more than a commercial venture, (they are opening a megastore as well), while the kids that end up playing for the local side will have to get their training elsewhere. And finally the return train journey, which went somewhat easier than the outward one. Above us at the station, a poster invites us to explore beautiful Hainan with Luneng (the owner of one of the Chinese Super League clubs). The global icon, David Beckham smiles from the poster, I wonder whether or not he ever took the advice of the poster. On the train, we took two seats together, (B/C) with a young lady at the window seat. I was expecting someone would come and claim the “C” seat, but as it happened, the person getting on at the next station wanted the “A” (as in window) seat. He took the aisle seat until the train staff came along, and was apparently told to stop complaining, as there were plenty of empty seats anyway! Here we go – Again. I get a feeling of déjà vu here. Cheltenham are struggling in the league, and have just been knocked out of the FA Cup by a team a division below us. Much of the pattern seems to follow the events of two years ago. A good win the first round of the FA Cup, two really bad results in the league and then cup defeat. In 2014, we panicked, changing the manager before the cup defeat and bringing in a new man who never became a Cheltenham man. The results over the rest of the season were disastrous, and further changes in management did not stop to rot as much as showing how much rot there was. While I am pleased that we are not instantly repeating the mistakes of two seasons ago. I was surprised by news reports saying that Johnson was having talks over a renewed contract in the midst of the worst run since he has become manager. The other thing that happened as 2014 came to an end was that we were all waiting for the transfer window to open, causing a listlessness to settle into both the team and support during December. I can already see a similar thing happening again now. The press, the supporters and most importantly the manager have now been continually on about the changes we will have to make in January. This must have an effect on the morale of the team. Last season, the team prevailed over teams with higher budgets and arguably better players. This was because all the players could think they were all in it together. Even loan players bought into the atmosphere, so it was not uncommon to see someone who was out of the team for some reason travelling to away grounds and standing with the supporters. We have lost the unity, even though we have kept the group together. This is now the challenge for Gary Johnson, as we cannot afford to wait for January and the opening of the transfer window. He needs to make the players believe in themselves now and to react to the last few results in the five games before the window opens. Both publicly and privately, it must be made clear that no one has been shelved yet and that they are all in it together, fighting to maintain their football league careers beyond January. For the board, the talk of contracts should be put on hold – it should be out there, but not signed until the day we are guaranteed to finish in the top 22 places in this division. The supporters too have the part to play. Less whinging about what the manager has done wrong. Maybe the summer recruitment was not up to scratch, but none of us knew that at the time, and we all supported the decisions to keep all of last season’s squad intact. (Our best run of results this season came from a series of games when all the outfield players had been here last season). The truth is that this season has not been a complete disaster, we are still more than capable of turning things around and at least being in a safe position by the first week of May. Until the last three games, the margins have been small. It has been clear that the team has not quite been sharp enough, but the football has been quite entertaining and we have held our own against sides such as Portsmouth. I do not believe that any of our players has failed every time he has come onto the field. Everyone has shown that they can step up to the grade, but too many have failed to do it consistently. It has to be remembered that while Saturday’s result is a blow to morale and pride, the three home games before the end of the year are far more important. The fixture gods have not been kind to us in this respect. Unless the weather intervenes, we will have played exactly half our league programme in 2015, but we will have played 13 home games and only 10 away. We cannot afford to tread water in the hope of making a change in the transfer window. We need to come back strongly before then, or it may already be too late before reinforcements can added to the squad. An interesting exercise, running my first survey. The results show not only some idea of the views of the fans, but also gave me an insight into how to write a survey. I feel that there is a benefit in running a few surveys of this kind to pick up the opinions of my clubs’ fanbase, and I will be suggesting this at a trust meeting. I used survey monkey to run the survey. They provided a simple, and importantly free service, although limited to ten questions. One does get rather bombarded by attempts to sell you their more professional services. At the time of writing, I have received 80 responses, 53 (66%) stated they were Cheltenham fans, 9 were from other League-1 or League-2 clubs, 6 from supporters of Premier League of Championship clubs, 7 for non-league and 5 with no specific club. Some 66% claimed to go to more than two thirds of home games for their club, while only 22% saw less than a third. Some 20% of respondents did not answer the question on away games, while 58% of those who responded saw less than a third of away games. 22% saw over two thirds. Survey Monkey allows the application of one filter only, and I think the most useful tool I can apply is to see how Cheltenham fans responded. For the viewing habits, the Cheltenham fans were slightly more pronounced, with 70% seeing more than two thirds of games and only 13% seeing less than a third. Again quite a few did not add away game details, but 53% of those who answered went to less than a third, while only 17% saw more than two thirds. It was my third question where I demonstrated my inexperience with questionnaires. I wanted to know which possible changes to league structure might be acceptable, but I did not specifically specify a no change option. I think it would have been best to split this to two questions, firstly whether one thought changes to the structure were a good idea, and then which ones were acceptable. After the initial burst of answers to the questionnaire, I edited this question to specify that no response meant that no change was acceptable, and after that there was about a 33% for no reponse. Among Cheltenham fans, 52% of those showing an option thought 20 teams in the Championship, 24 in other divisions would be acceptable, 27% would accept 22 in the lower divisions and 30% would accept the originally publicised divisions of 20. When expanded to all replies, there was a smaller difference between those who thought it acceptable to drop just the Championship to 20 teams (42%), and those who those who would go for 20 throughout the structure (39%), the 20 team championship and 22 in other divisions stayed at 27%. The numbers do not add up to 100 as multiple replies were allowed. I then asked where new teams brought into the structure should come from. The results were overwhelming for doing this on merit alone (i.e from the National League). Only five people thought it may be acceptable to bring Celtic and Rangers on board, four thought reserve/development teams could be accepted and only three thought that franchises could be started in cities (for example in Dublin, Belfast or Edinburgh). Three of the four who would accept reserve/development fans were Cheltenham supporters, (the other had no specific affiliation). Within the promotion on merit selection, there is a preference for no rules over the demanding licenses based on ground facilities and finances. When the option of a five division structure was suggested, and the question, should the lowest divisions in this be regionalised North and South, there was only a marginal rejection (55% to 45%). When this is limited to Cheltenham fans, it becomes more pronounced (60% against). As Gloucester City travel further on average to each away game in their regionalised division then Cheltenham do in their National one, this is understandable. Interestingly, even if not a big enough sample to be truly accurate, of the 12 responders who said they travel to more than two thirds of away games and who also answered this question, there was a positive response (7 to 5) in favour of regionalisation. Finally, the FA Cup, where there are again clear indications, 84% want the Cup to stick to weekends, and 71% think replays are an essential part of the competition. Here the Cheltenham fans are slightly less committed, at 82% and 66%. The minorities in both groups that think replays could be scrapped would do so for all rounds. There are few who that they should be scrapped from the First or Third round proper, keeping replays in the earlier rounds. If you were to ask me “What is the Whole Game Solution”, then my first, two word answer would be “a misnomer”. There are just fewer than 6000 football clubs in this country offering Men’s Saturday Football. The whole game solution is a change to the structure for 100 of these clubs, and it clearly favours the requirements of 40 or less. At the moment, the “Whole Game Solution” is, according to the EFL, a discussion document. I have not seen the full document, but the football league themselves have summarised the proposals and the reasons for them and this can be viewed at http://www.efl.com/news/article/2016/a-whole-game-solution-3119809.aspx. After the initial discussion during the summer’s AGM, the League has then had further discussions with the Premier League and the FA, and have then asked for club’s opinions on various options. This has been published on-line, http://www.fsf.org.uk/assets/Downloads/News/2016/SH-WGS-letter-to-clubs-August-2016.pdf and this gives more insight into the thoughts of those who are making plans. Unfortunately, the letter in the second link is dated August 17th, and requested clubs to respond by the 2nd September, prior to the next club’s meeting on 22nd September. This letter was not initially released to supporters’ organisation, so while the League claim that they want input from all stakeholders including fans’ groups, the truth of the matter is that we are already playing catch up. Despite being a board member of a supporters’ trust, and even though the trust has a fan elected director, I had not heard of the 2nd September deadline until it had passed. I do not know of any club that has asked for supporters’ opinions in this time span, but several have now promised some form of consultation before any clubs vote on final proposals at next summer’s AGM. It is just that supporters do not appear to be getting a chance to shape proposals first. Indeed the clearest response was a rejection by AFC Wimbledon, but even this was done without consultation of those fans who are not on the trust board. The base plan was a new structure with 100 clubs in a Premier League and a Four division English Football League. All divisions to have 20 clubs, with three promoted and relegated from each division. While the football league appear to demand the three up/three down between their structure and the Premier League, there is a notable omission where they do not specify whether they will keep two up/two down at the bottom of what will become League-3, or whether this could be increased or reduced. The Football League had a number of other questions on their mind. In particular, in response to the loss of income from the reduction of games, they have now suggestions a Championship of 20 and three division of 22, (requiring 14 new clubs, rather than 8). I can see the logic of reducing the numbers in the Championship, where the fact they also take international breaks, means there is an inordinate amount of midweek matches, but I would keep 24 at the lower levels. Either not reducing or a lesser reduction in the number of games for lower division clubs would also mean they are slightly less reliant on the distribution of money from the higher leagues in order to keep the current fully professional set up. I believe my club currently receives between 25 and 33% of its income from these sources. If they were to balance the loss of 4 homes games, then this would be close to 50%. While one may see the Premier League footing the initial bill, if their own agenda is met; who can say what the situation will be five years down the line. It would be foolish to assume the supply of golden eggs being laid from the TV contracts will keep growing. If at some time in the future, the amount is reduced, or at least stops rising faster than inflation, will Premier League clubs (who earn the money) wish to reduce their largesse to the rest of the league? The Football League has also asked where additional clubs should come from. To most supporters, this is easy – the best clubs in the National League should be promoted to fill vacancies. Maybe with some restriction to deny promotion to a minority who either do not have the facilities or have a poor financial model. A financial fair play rule as currently enforced in League-2 would be a slap in the face to the promotion prospects of clubs such as Eastleigh and Forest Green. However, that is not the only potential source of new teams. The idea of reserve/development teams in the league has already been raised, and slapped down by public opinion. Despite this the league clubs voted to take the extra cash on offer to degrade the already maligned EFL (Checkatrade) Trophy, by allowing some of these teams to enter. If there is a significant cash boost, would clubs vote now for them to join the league? There is one other source of clubs that gets mentioned quietly on the sidelines, and this clubs outwith the English system. Top of the list here, as always are Celtic and Rangers, but there is also the thought that new clubs could be formed, simply to take up places. The word franchise, considered the ugly word of English football ever since Wimbledon morphed into MK Dons would be more accurately placed against new clubs, which could be in cities such as Belfast and Dublin. The franchise would be initial only – once a club had been installed in the league (possibly as high as championship level), promotion and relegation would come on the field. The problem with any such move is that while it is not against FIFA and UEFA rules, (there are plenty of other examples of clubs playing within a different country’s league), it must be approved by the FAs of both countries. The Scots would almost certainly rail against such a move, but one would be less ncertain that the two Irish organisations would. The league also asked if they should consider regionalisation of the bottom two divisions of the new structure, so as we end up with League-2 North and League-2 South. Of course, regionalisation does not mean that every club in the division travels less distance. We are in a national league, with an average journey of 108 miles to away games. We share the ground with a club in a regionalised league and an average journey of 124 miles for away games. Regionalisation has two other effects, it reduces the scope for promotion, the promotion places being share by the two divisions, and it reduces the profile of the leagues. Hence the overall crowds would be less. While no other country has as many national divisions as England, many leagues have introduced new national divisions in recent years, and in France, Germany, Switzerland and the Netherlands, this has resulted in some degree of increased attendances compared to the regional leagues. The expectation ought to be that regionalisation will reduce attendances overall, not increase them. Incidentally, long winter breaks are not common across Europe, despite the general opinion that all the rival leagues have them. Italy plays matches on the 22 December, and then returns 17 days later, the French do similar (with the cup when they return). Spain has two Saturdays off, but have cup matches every midweek, except the one between Christmas and New Year. The Bundesliga has been shortening the winter break as modern pitch technology means they can promise matches are on. They still take a full month off with games on 21st December and 21st January. Full internationals are spread rather unevenly through the season, there are monthly international dates in the autumn, in September, October and November filling up a crowded schedule for the top players who are also involved in league and European club matches, then there are the qualifying games and tournaments held at the end of the season – but without doubt, the fixture dates that European clubs would most like to end is the one set of spring fixtures – which this season falls across the Easter weekend. The football calendar is strangely static, while Easter is a movable feast – and anyway in football terms it is only within Britain that clubs tend to double up with two fixtures over the weekend. With the inevitability that Easter is either an international week, or between Champions League mid-week dates, the Premier League generally forgoes the idea of playing two sets of fixtures within four days. Oldies like me who grew up watching Southern League football in the seventies remember the Easter weekend as a time for a triple header with games on Friday, Saturday and Monday. Whether the clubs have one match to play over the weekend, or three, or even now with the Premier League taking an enforced break, this set of fixtures is unwanted by the clubs not just in England, but across all of the main leagues in Europe, where it is an unwanted interruption at a vital part of the season. While we can understand the top level club’s annoyance at the enforced break and the disturbance to their season, at least the league fixtures stop when the internationals start, and the clubs will be pressurising the national teams not to make many substitutions and not “over tire” their players. The same is not true in the National League, there are ten matches in the league on the Saturday before Easter, and then a full programme split evenly between Good Friday and Easter Saturday, followed by another full programme on Easter Monday. Despite this, the FA has seen fit to arrange a ‘C’ International on the Tuesday before Easter – and at that a match away in the Ukraine. England’s ‘C’ International team is an anachronism, (and when did the ‘B’ team last play, anyway?). There was once an England Amateur XI, and this had some value – the best players from the Amateur game, playing against amateurs from other countries. But even fifty years ago, some of the “amateur” players were being paid more than semi-professionals at neighbouring clubs. The FA slowly got to grips with the problem, abolishing the official difference between amateur and semi-professional football. There are still amateur footballers of course, just turn up at any playing field in the country on a Saturday or Sunday and you can see them chasing after a ball hoofed down the pitch. Still, with the top level outside the football league being entirely semi-professional, a semi-professional National team was formed. This was mainly from the top level of non-League, with a few names appearing from lower levels. In their time, Cheltenham Town supplied a few players to that team, and I recall going to Hayes to see a team including Steve Book, Mark Yates and Neil Grayson beat Italy by 4-1 at Hayes, (Grayson scored the first two goals). At this time, if a team relegated from the Football League remained as professionals while hoping for a return, their players were not picked. But now, the rules have changed again, and most of the players picked this year are already full time professionals. One has to ask why full time professional players for clubs such as Cheltenham Town can now qualify for international football, but not if they are one level higher? In other words, is the line defining this level now rather arbitrary? Once we have decided to have such a team, why run it in such a shambolic fashion. With the players all having games on Saturday, they will meet and train briefly on Sunday, travel on Monday, play on Tuesday and return to England in Wednesday. Hardly a chance for them to gel together. They will look like players who have only met, simply because they will have only just met. It is no wonder that the last time I saw the team play, they lost to a Gibraltar National team. Any club team in the National League could have won the match, but a selection of players who met a day or two before the game could not perform. There was a training camp for potential players in the team, held back in the autumn, but the 16 players that have been selected to go to Kiev do not reflect that camp. Only half of the sixteen were in the 23 training at Warwick University in September, (no prizes for noticing that the ‘C’ players did not even get to use the FA’s much lauded facilities in Burton). I am expecting that when it comes down to it, Paul Fairclough will be receiving and making plenty of phone calls over the weekend as his squad is worse than decimated by withdrawals of players who choose to put club before country and cry off over the weekend. If England are to have an International team at this level, it needs to be better run than this. England apparently have three matches in the International Challenge Trophy, playing in Kiev this week, then at home to Slovakia (June 5th) and finally travelling to Estonia in the Autumn. The logic of not playing now and trying to play all three games with a single squad in the summer seems to have escaped the FA, as has the idea of holding a training camp, and then using players from this in the playing squad. Oh, and if they are playing in an organised competition, why is it impossible to find the details on the internet. What purports to be the official web site goes off line without mentioning England’s last result in the last tournament. The FA see fit to mention the squad, and the matches and competition, they even let on that England won that last competitive match (4-2 v Estonia at Halifax). Still, the page says “There are no upcoming fixtures available”, only four days before a game. Time to change the subject. While the European teams are playing friendlies ahead of Euro 2016, in the Americas and in Asia, World Cup qualification for 2018 is taking place. The expectation, we reach the end of the round, which should mean nine teams having their (generally narrow) hopes of making it to Russia finally dashed. One of these will in fact by decided a few days later by FIFA, but I will come back to this later. It is best to start in South America, as nothing can be decided there. All ten teams play 18 games in a home and away league, with Ecuador the unexpected leaders with 100% in their first four games, including a 2-0 away win in Argentina in the first game. Ecuador will play at home to Paraguay, who have also made a good start (7 points), and then travel to Columbia who are trying to make up ground after a poor start. Argentina will be trying again to get their campaign off the ground. Although they have not lost again, they drew the home match with Brazil, and were held 0-0 in Paraguay. Argentina’s only win to date is away to Columbia and both are outside the position required to qualify at this early stage. Uruguay with three wins (Chile and Columbia at home, Bolivia away) against only one defeat (in Ecuador) stand second in the table, with Brazil in third. This makes the Brazil v Uruguay game the standout match in this month’s matches. Venezuela sit bottom of the table, the only team with no points (or indeed without a win). They travel to Peru (3 points and 9th out of ten countries) before entertaining Chile. On to the CONCACAF region. Here they are down to twelve clubs, with 23 of the area’s nations already out. The current round has the teams in three groups of four, the top two from each group making up the final group of 6. This gives a stretched schedule for this round – two games were played last November, two this month and the final pair in August/September. The matches this week see each team playing their opponents home and away. In Group A, Mexico have won their two games to date, and play Canada who have four points. The first match is in Vancouver with the return in Mexico City. This means that either El Salvador (one point) or Honduras (none) could go out if the results go in the wrong directions. El Salvador get home advantage first in their duals with Honduras. Group B has Costa Rica (6 points) playing Jamaica (3) with the first game away, while Panama (also 3 points) play Haiti (0) with the game in Haiti first. And so to Asia. The current stage is eight groups, all but one of which has five teams, (Indonesia’s expulsion leaves one group of four). This is the last round of matches and the next round is two groups of six. Hence all the group winners and half the runners-up go through. Only two teams have guaranteed their place in the next round, South Korea and the Qatar all-stars (well, rather too many of them were not born Qatari internationals, you can still buy a certain degree of international success). If China underperform, I do not know what words describe India’s football team. They sit on three points from six games, with a high chance of finishing behind Guam. Yes, they may finish behind Guam, a tiny American territory. Guam’s coach in English, Gary White (28 games for Bognor Regis, after which he left the country – he has managed the British Virgin Islands and Bahamas before going to Guam). Guam is highly thought of by the FA, who have included him on the elite coach training programme, the highest level. Still, I do not see him mentioned as a possible for jobs in the Premier League. 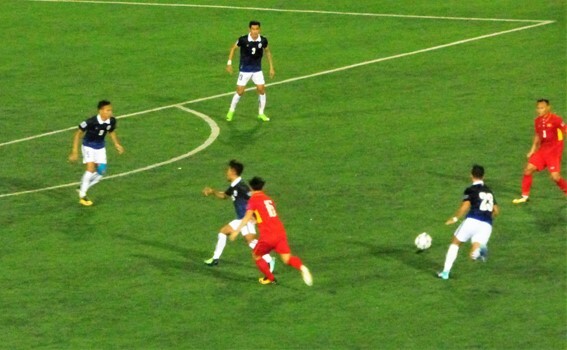 All this comes to little, as despite their best performances in a qualifying tournament, Guam have already been knocked out, with just the visit to Oman to come. Oman are second seeds, and finish their games with a match away to Iran, currently three points ahead of them. As India are the first visitors to Tehran over the weekend, I cannot see the positions changing. Turkmenistan play India in Kochi in the final round, but I think the will be fixed in third place before that. Oman may have as few as 8 second placed points. If you want to see decent football played in Oman, you may as well choose to watch Syria as Oman. Despite the problems that have caused the Syrians to play all their home games in Oman, they have done remarkably well, and we know that the top two in Group E will be Japan and Syria. Japan are at home when they meet in the final game. Syria lost to Japan in Oman, watched by a crowd of 680, but they have won their other five games to date. Japan have also won five games, and not conceded any goals, as their other game was a scoreless draw at home to Singapore. Oman will play Cambodia before travelling to Japan, Japan play Afghanistan (another who cannot stage home games) first, while the other game on the final day sees Singapore travel to Iran to play “away” to the Afghans. Although Japan only lead the group by a point, I expect them to prevail, but as Syria already have 12 second place points (Cambodia have been confirmed in last place), they will get the nod as a second placed team. Group F is Indonesia’s group and hence has only four teams. Thailand lead Iraq by five points. Like Afghanistan, Iraq are playing their home games in Iran, (a choice I thought was odd, surely they would get a better reception in an Arabian country?). Still, I am expecting Iraq to win both their games, at “Home” to Thailand first, and then to Vietnam which would allow them to finish ahead of the Thais. Still, as we do not take points off the Thai total, (there not being a fifth placed team), Thailand already have 13 second placed points, if that is where the finish. Should Iraq slip up, then they will have 8 points, plus whatever they garner in the last two games, (and they need two wins to go through). Vietnam still have the chance to finish second, by beating first Chinese Taipei at home (should be easy), and then beating Iraq (and assuming Iraq have not beaten Thailand). Still this only gives them ten second placed points. Taking the groups out of order for once, group H sees North Korea and Uzbekistan fighting over the top places. North Korea only have one game to play, but are a point ahead. This final game is in the Philippines. This is after the Philippines visit Uzbekistan. The second seed in the group, Bahrain are currently in fourth place, a point behind the Philippines. Yemen are assured of last place, barring an unlikely barrage of goals when they travel to Bahrain. SO finally we come to Group G, the one that is not decided on the pitch. Kuwait have been suspended by FIFA, their games have therefore been postponed, but not already awarded to the opposition. Instead we await a FIFA decision on this. The precedent is that Kuwait’s game in November was also not played, and was then awarded to Myanmar. That result immediately put South Korea (six wins out of six) through as only Kuwait could catch them, the Kuwaitis needing to win all of their last three games to overhaul South Korea. The table still shows Kuwait in second place, but there is no sign of them regaining FIFA recognition in time to play these last two games. Lebanon need to win both remaining games, firstly in South Korea, and then at home to Myanmar to reach ten second place points, which does not look to be enough. However, if FIFA decides to expunge the Kuwaiti result en bloc, then this redraws the table as all points then count. South Korea still win the group, unless Lebanon has won twice, but Lebanon have nine second place points, which increases to 12 with a win against Myanmar – putting them through to the next round. (In the unlikely event of South Korea losing the group leadership because of Kuwaiti being disqualified, they would still be the best of the second place teams). It appears to me that a team will need 11 second place points to go through, with a possibility of this then being decided on goal difference. If this drops to ten points, then I am sure goal difference will decide. This is good news for Saudi Arabia, Syria and Thailand, all of which expect to go through even if they finish second. You are currently browsing the Football Shaped blog archives.